Hello! I have been away a while, sorry. 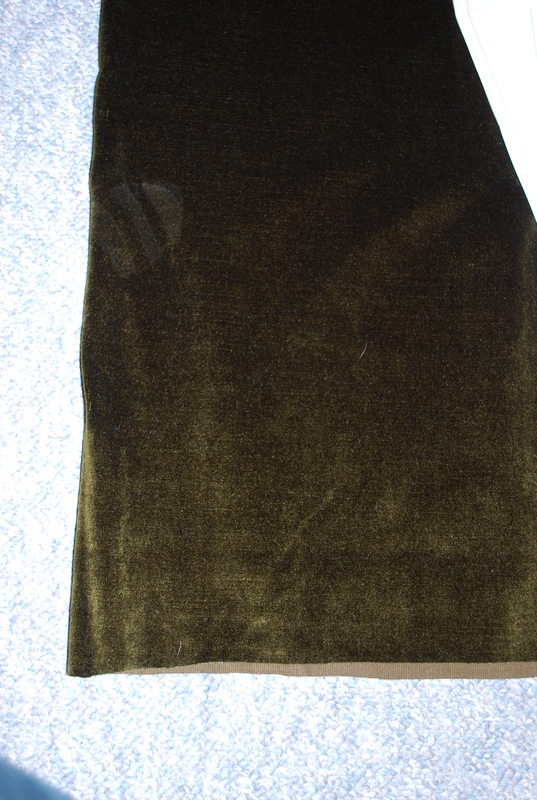 I noticed this skirt almost as soon as it was released by the VPLL site. I was enchanted by the pointed scallops on the front flap. I received this pattern from them at the end of April!! Quite a while ago! And although I was quite eager to start it after deciding which fabrics to use (I decided to use only fabrics I already have in my stash for the 1912 projects, to use it up), which as usual took some time… first I had a studio move which took two weeks of my energy and once the dust had settled, literally, my day job caught up with me and kept me busy for several weeks. I am glad those weeks intervened. They allowed me to think seriously about this skirt. 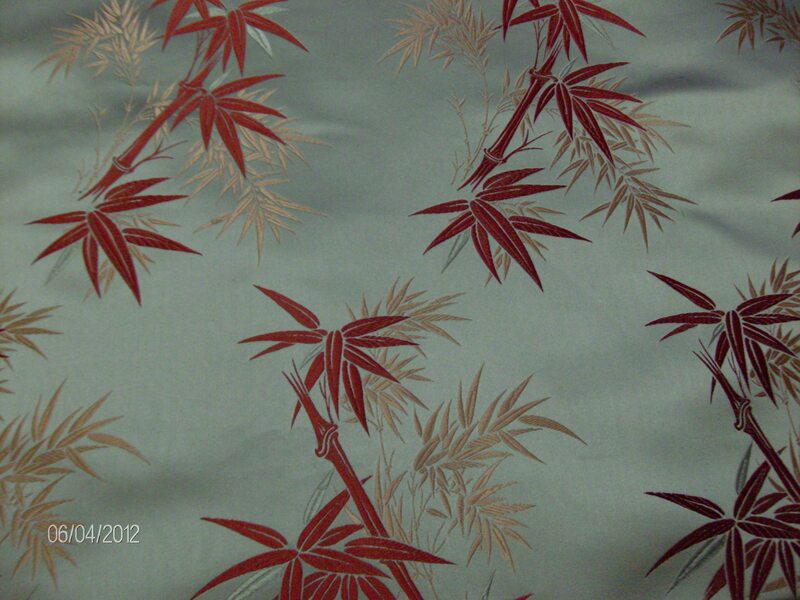 The fabrics I chose are fall colours as well as fall weight. I have had a lovely plum corduroy for a few years, just waiting for the right time. 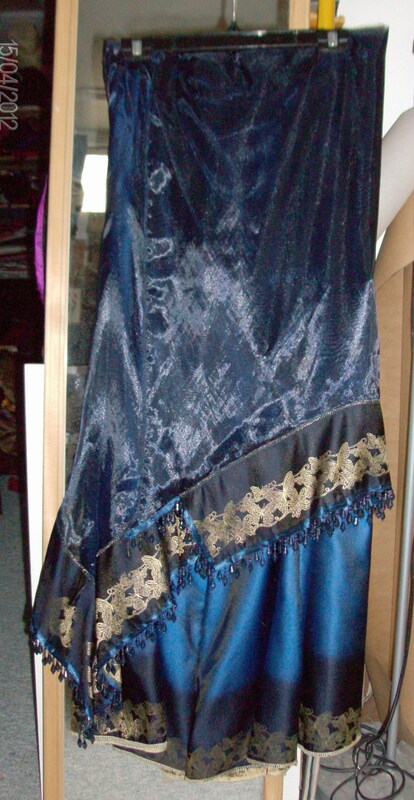 Two years ago I acquired a smallish piece of velvet from a friend which really looks marvellous with the plum cord. 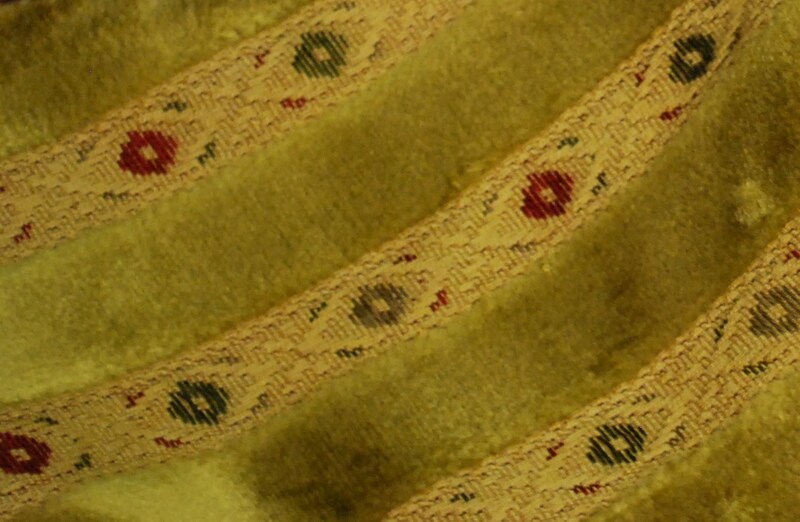 The velvet is extremely soft and has a wonderful print on it in shades of tan, burnt orange, 2 shades of golden-yellow, 2 shades of lilac, 2 shades of violet, rust, brown, olive and the background plum. It depicts scenes of riders on horses and a lot of lush vegetation. The print is reminiscent of 16th Cent. Turkish or Indian designs. It has a splendid *hand* and looks beautiful. 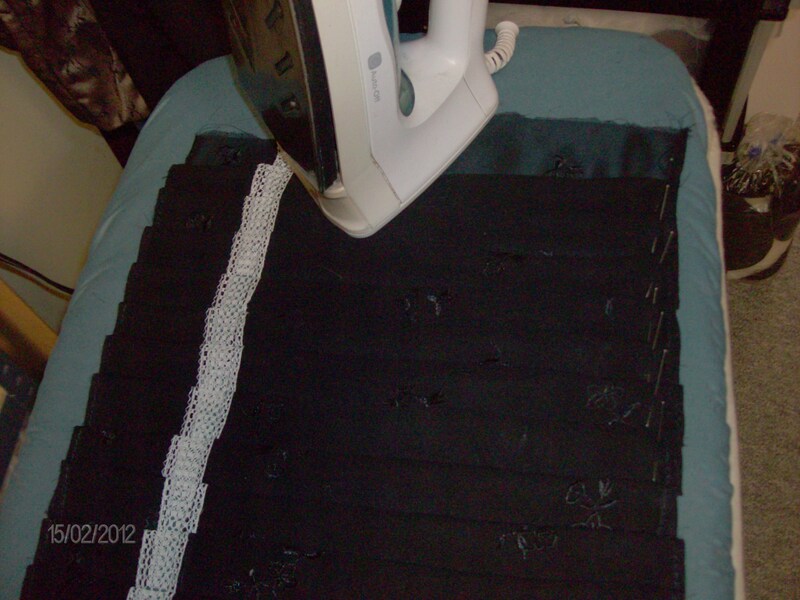 As I was finishing swagged drapes for the Museum, I was preparing mentally for my much-anticipated #200 skirt. 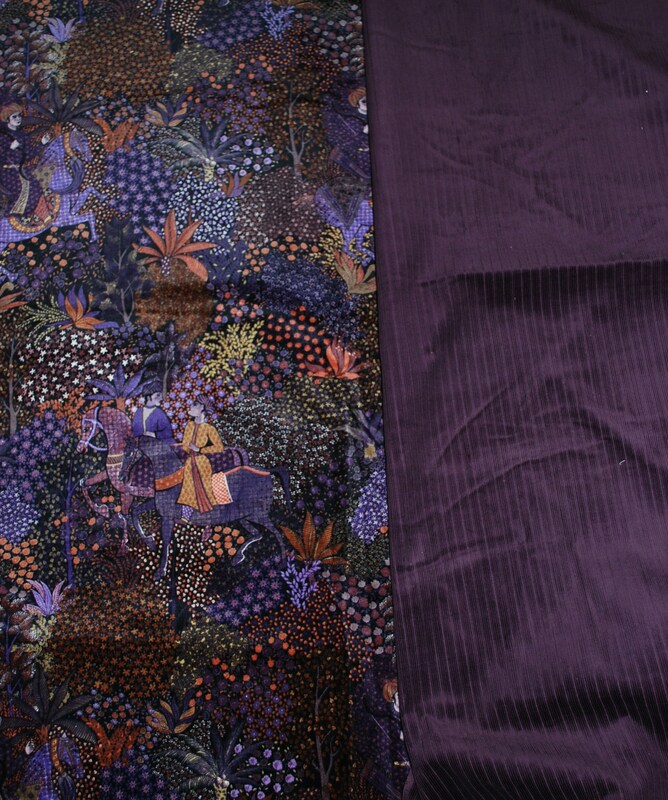 I came to the realization that if I actually made a skirt with these fabrics, for use in fall and winter, I would hardly ever wear it. Fall is miserably damp and increasingly cold until winter hits us with its miserable cold and often damp. I hardly ever wear skirted clothing in winter. It doesn’t keep me warm enough. What to do, what to do? 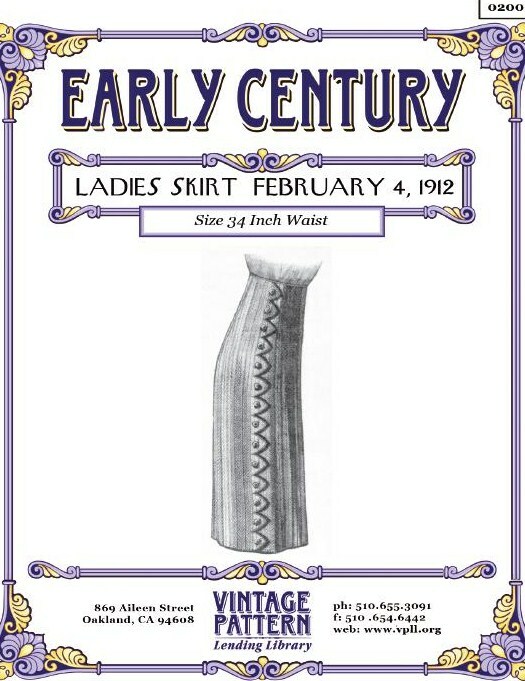 This skirt reminded me of a sarong, or a wrap-around skirt and I really liked the pointed scallops of its front panel. 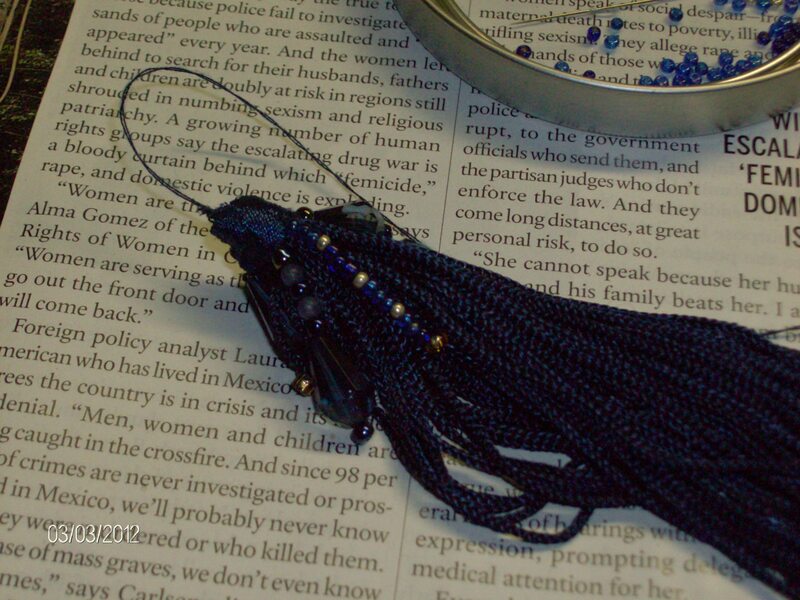 And I had been thinking so much about my lovely plum cord… really looking forward to finally wearing it. Make pants! 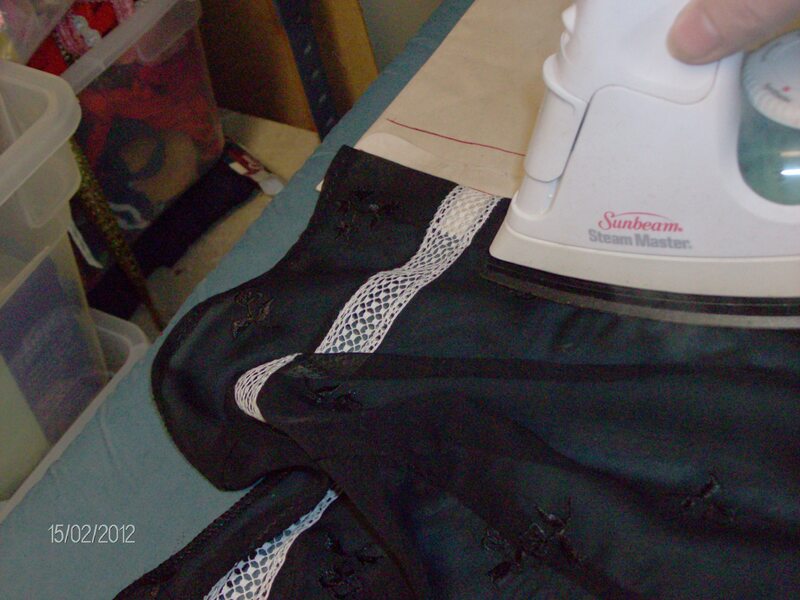 Use the front scalloped piece as it is meant to be, but put it over pants rather than a straight skirt. YES! And so my *skants* idea was born. My husband coined that word, using the *skorts* (combo shorts and skirt) as an example. Another volley of bridal sewing prevented me from getting to it last week. I took my weekend to start the #200. 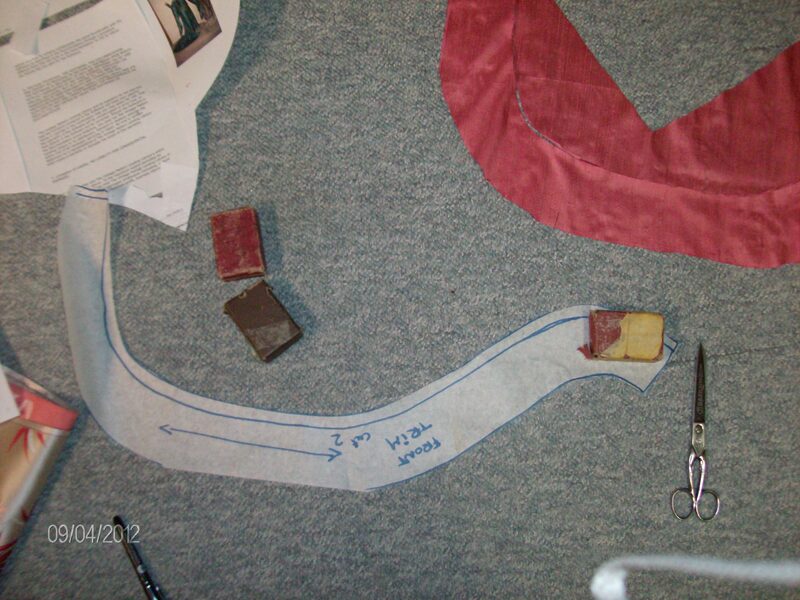 I cut it out, using my very simple pant pattern for the cord. In order to make the front scalloped piece the right size, I overlapped the pant pattern on the #200 pattern and cut the front flap so the scallops would be half way across my right leg. It entirely hides the front left leg. 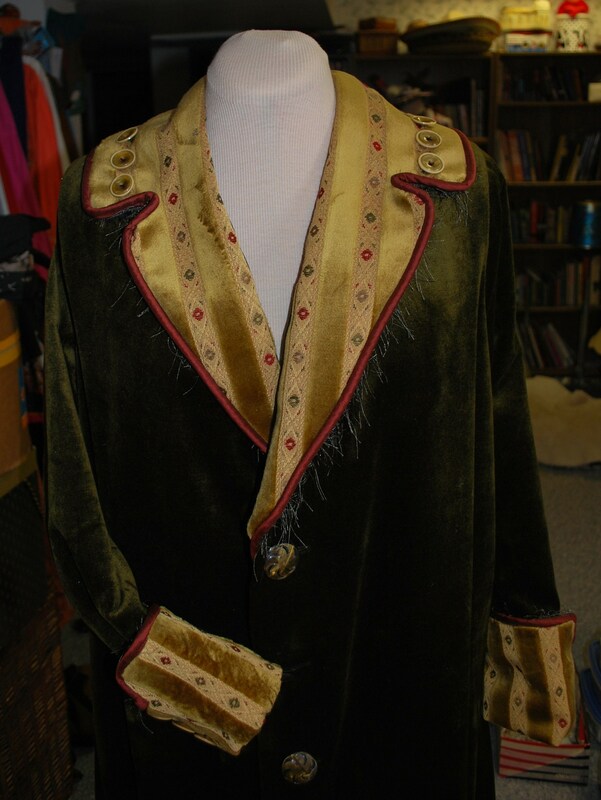 I cut a facing from the same velvet as the flap and sewed it to the scalloped front piece. 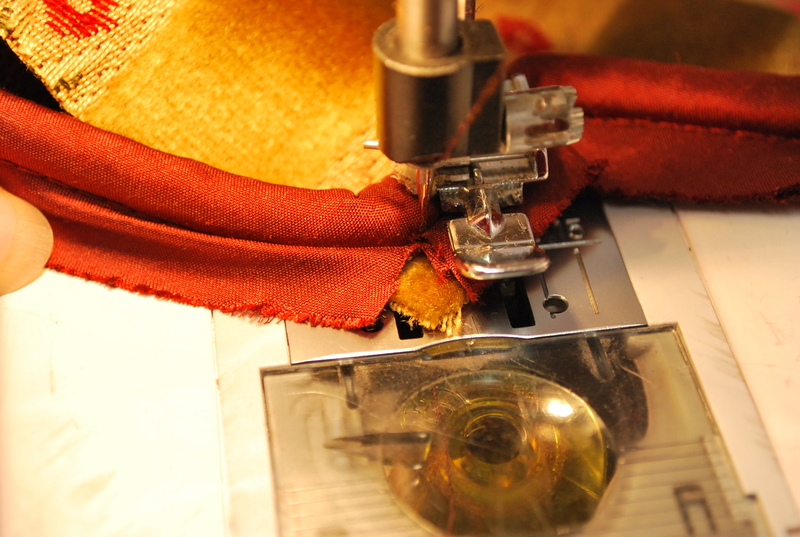 When sewing points like this, it is better to use a shorter than usual stitch, so the seam doesn’t allow as much fraying after you have cut away the point and cut into the valley. I also strengthen the points and valleys by using a drop of Fray-Check on them. Making these cuts assures a sharper point in both directions. See photos. I cut the waistband facings from the cord. 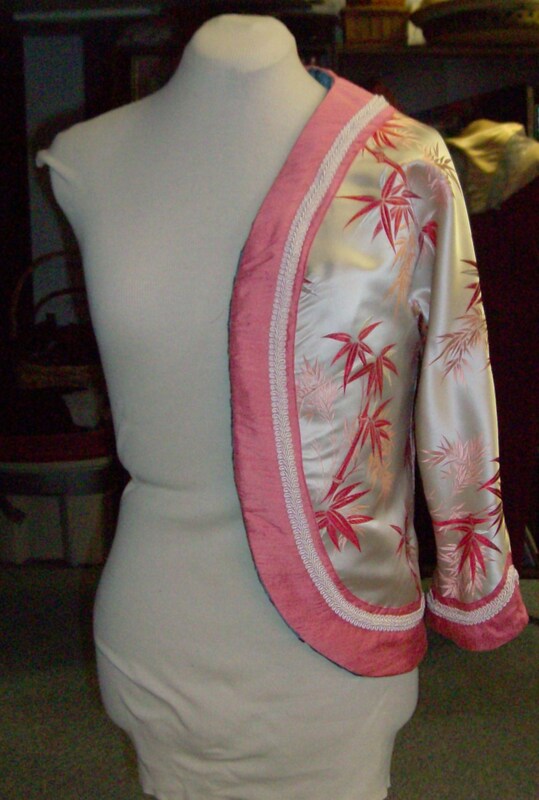 Because I am putting in a side zipper, the front waist facing is all one piece, the back facing is also just one piece. They got sewn together on the left side, leaving the right side open for the zipper. 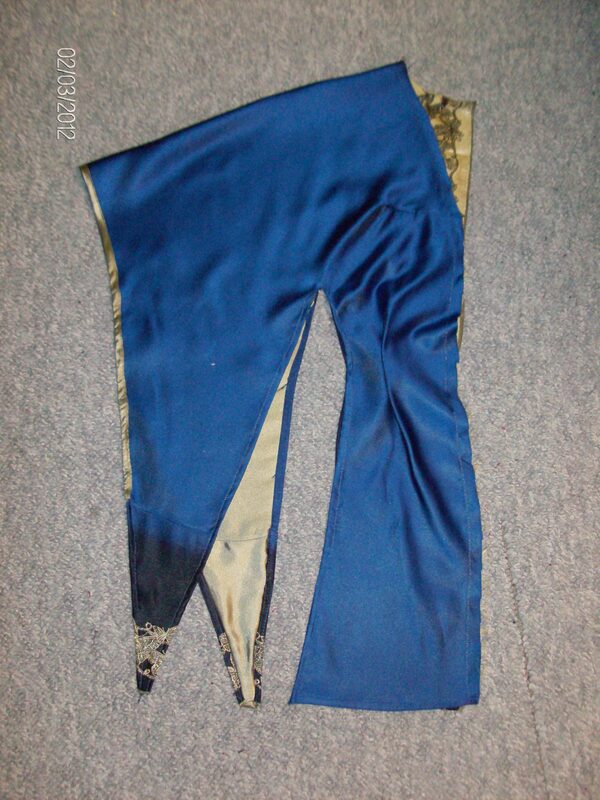 I assembled the pants by sewing the middle seam of front and then back. I sewed a (covered) zipper into the right side seam and I then finished that leg by sewing the inside seam of both legs. In order to have the scalloped flap sit properly, I inserted it between the front and back pant pieces and sewed the side seam up! The next thing to do was attach the facing after trying on the pants for fit. 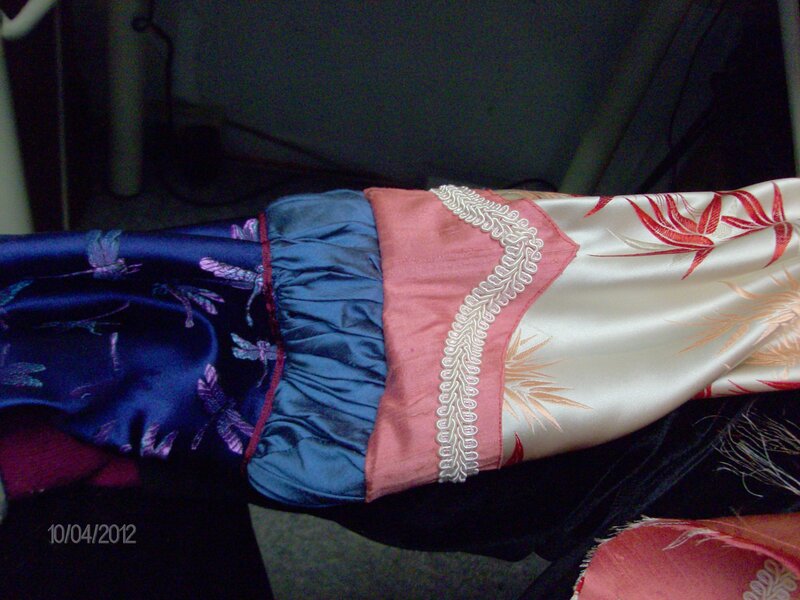 I decided to sew the printed flap all along the waist into the facing. Then I had to choose buttons. How many I would use would simply depend on how many matching ones I could find in my boxes. 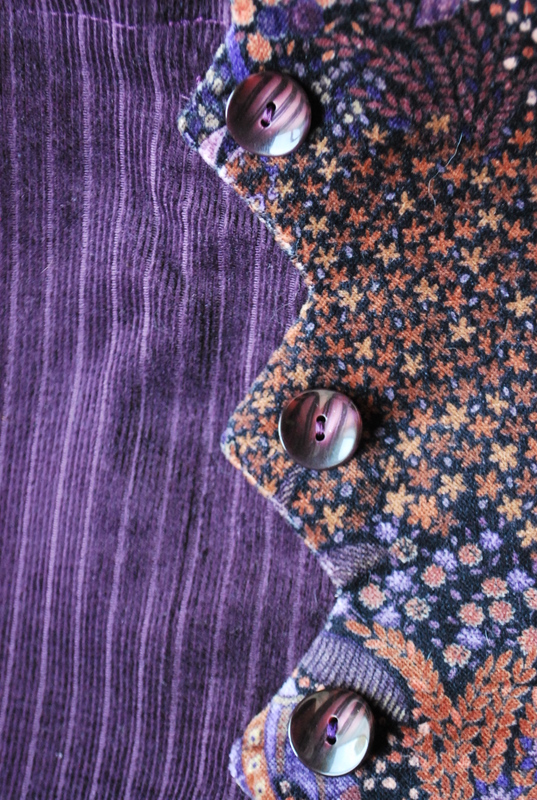 I found four plum coloured buttons with stripes on them. They look like they are corduroy too. Perfect for this! 🙂 There were only four but because these are pants after all, I thought to let the flap do exactly that! It is loose from the fourth scallop down. That way it is easier to walk. 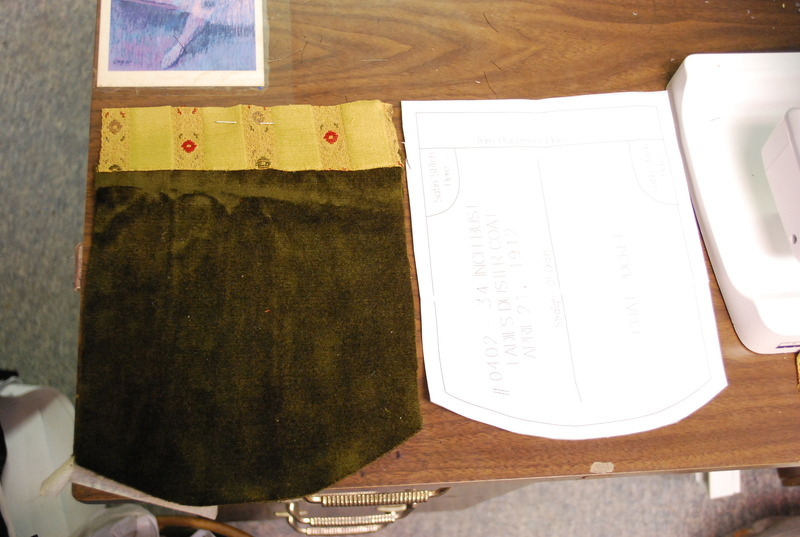 Then I hemmed the pants and the flap. I tacked down the flap’s facing and also sewed the top four points down to the pants because they had a tendency to curl outwards. Can’t have that! 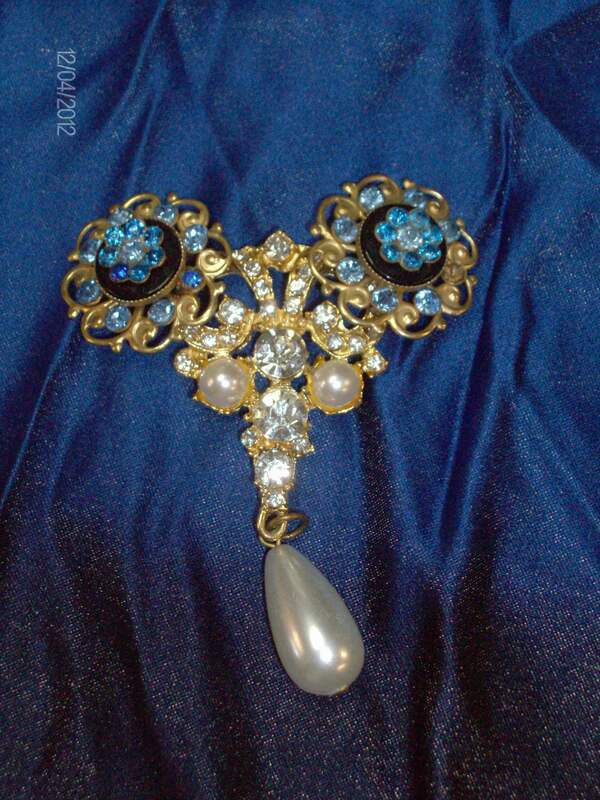 I am a professional seamstress and designer. The instructions for assembling the skirt were easy and straightforward to me. I simply didn’t use them as I ended up making pants. 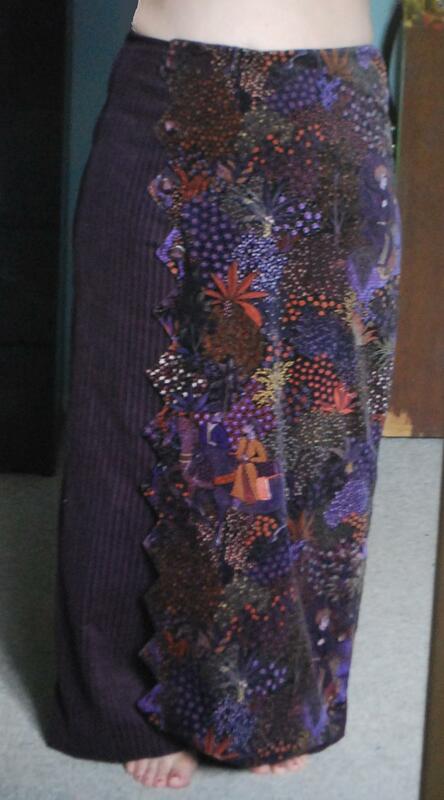 If I had made the skirt, I would have had to alter the pattern to a larger size than what it came in. 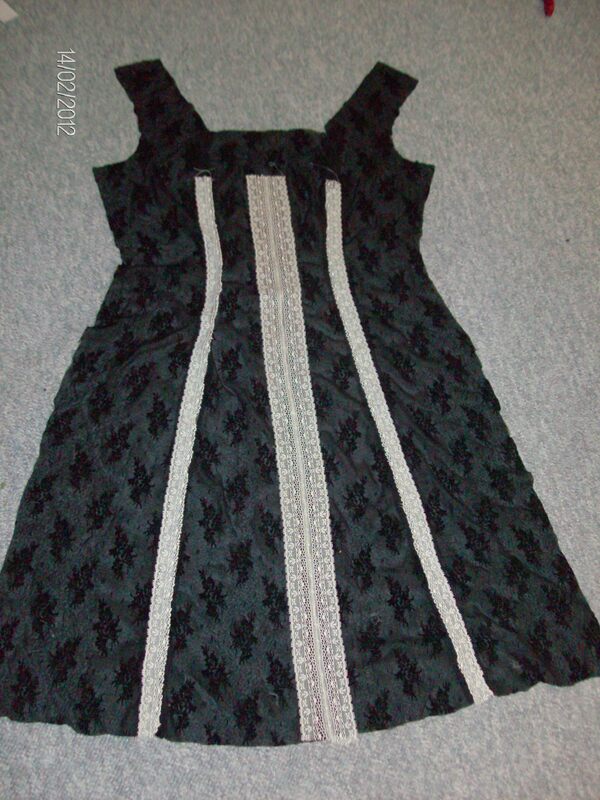 I did however recommend this pattern to a friend who also likes the vintage clothing look. She is an avid hobbyist and understood the instructions easily. I would think that an intermediate level seamstress would be better suited to this pattern, as the scallops do require attention to detail and careful cutting and assembling which then need special cutting for a nice sharp edge. Last week I requested the Spring Mantle from the VPLL website. 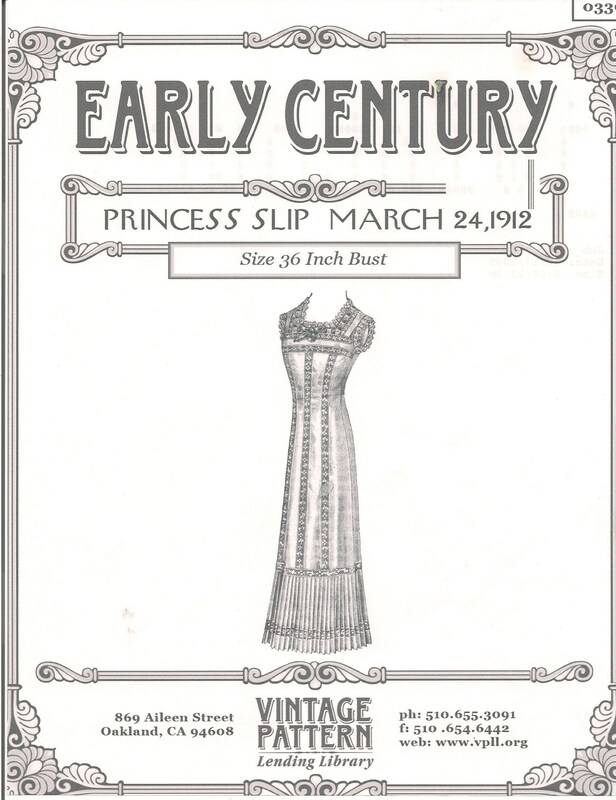 I had finished all my *real* work and was ready for more 1912 sewing. 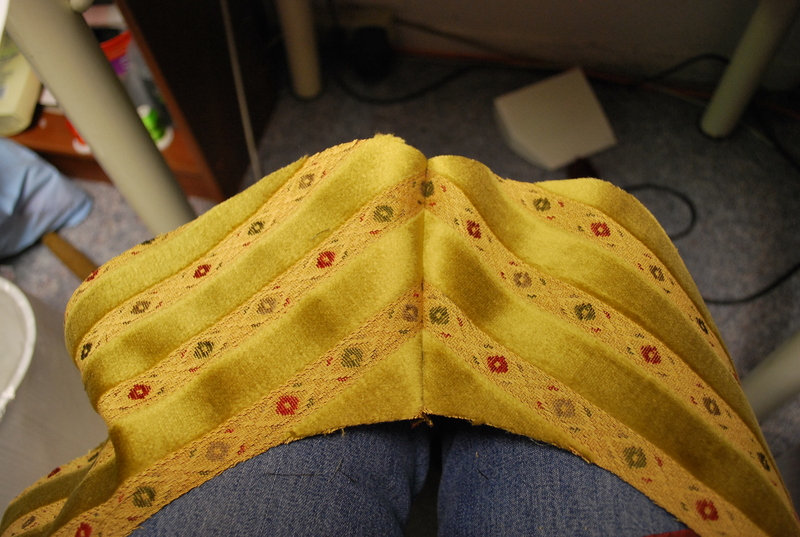 I thought making this little mantle would be fun… I still have so much fabric in my stash that needs a life!! :-). After downloading it and printing it, I read the instructions and somewhat regretted my impulse a little. 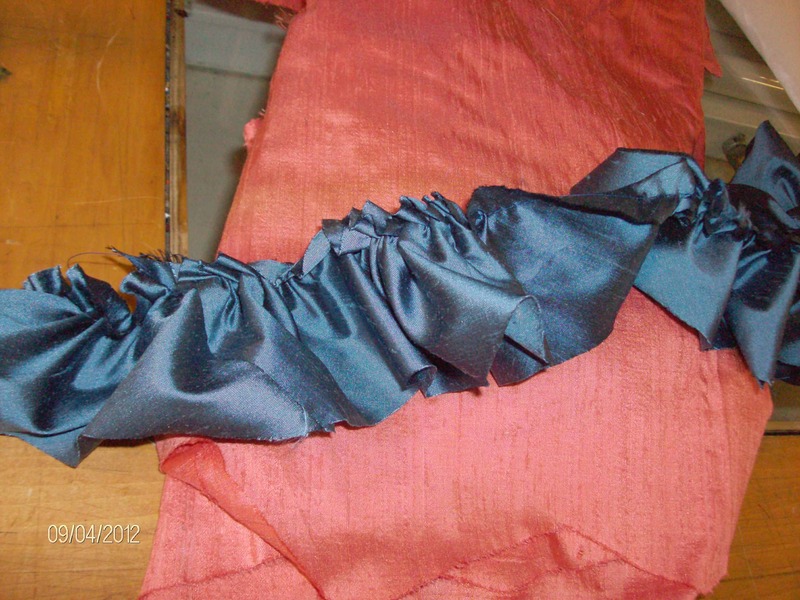 It requires 10 yards of bias cut fabric to be gathered into gathered trim for the sleeve edges and the front! I hate making gathered stuff! 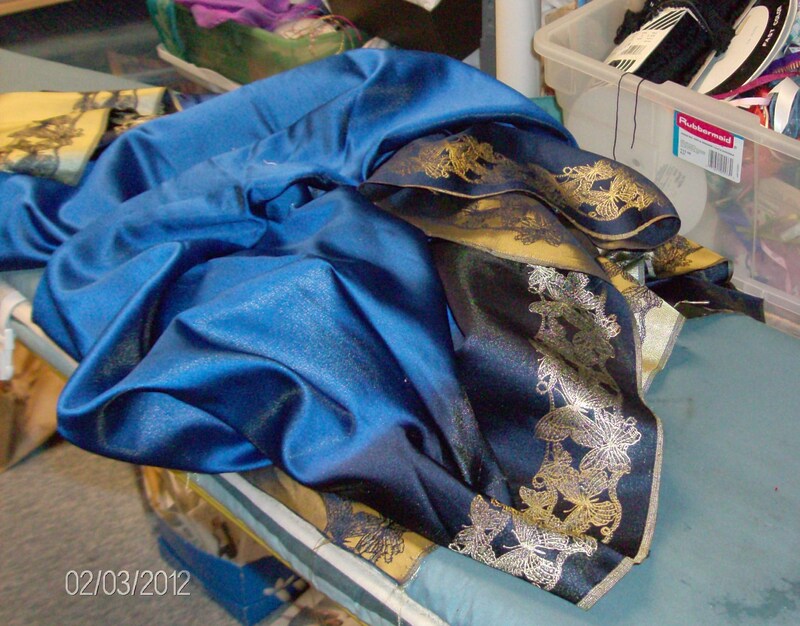 But I bravely took the pattern to my sewing studio and searched for a large enough piece of fabric in my stash. I decided to make it reversible when I couldn’t decide which to use: the royal blue or the coral. 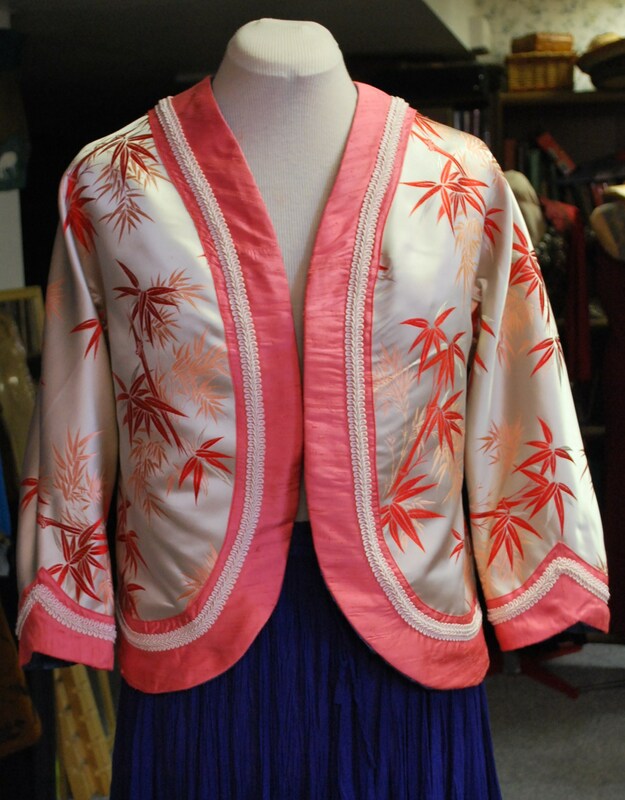 I have had that piece of 100% silk coral brocade for many years. 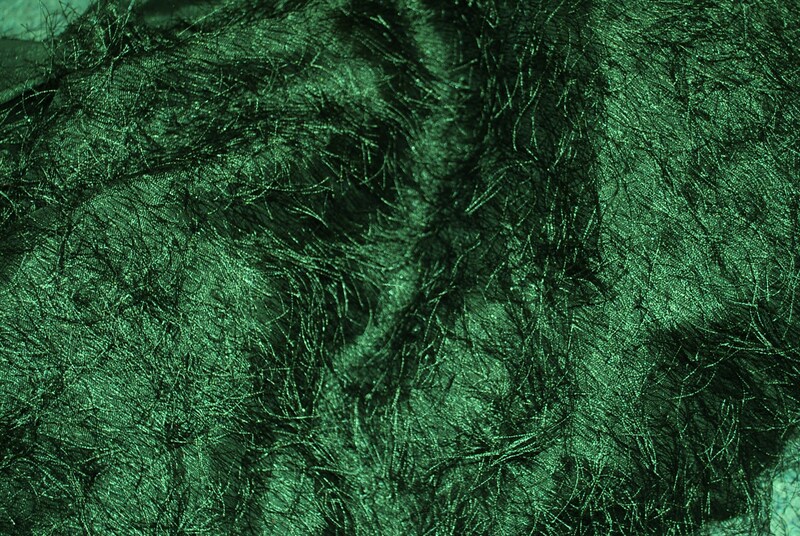 I always knew I would use it for a jacket of some kind as it is fairly thick. 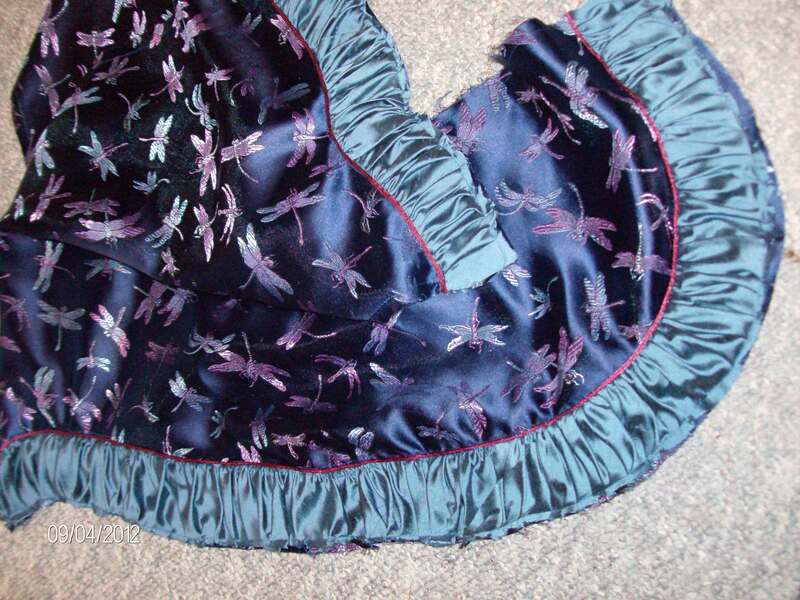 The blue satin brocade with dragonflies was a remnant. Lucky there was enough for this!! but the coral was too narrow. I had to piece two corners of each side: at the sleeve and on the side back. They don’t really show as there is a wide trim covering most of those seams. 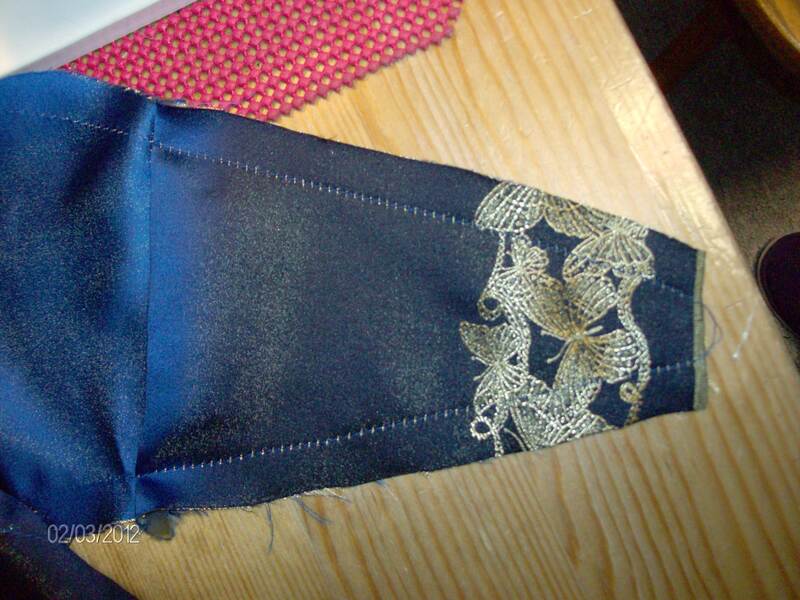 Starting with the blue fabric, I proceeded a little differently from the instructions. 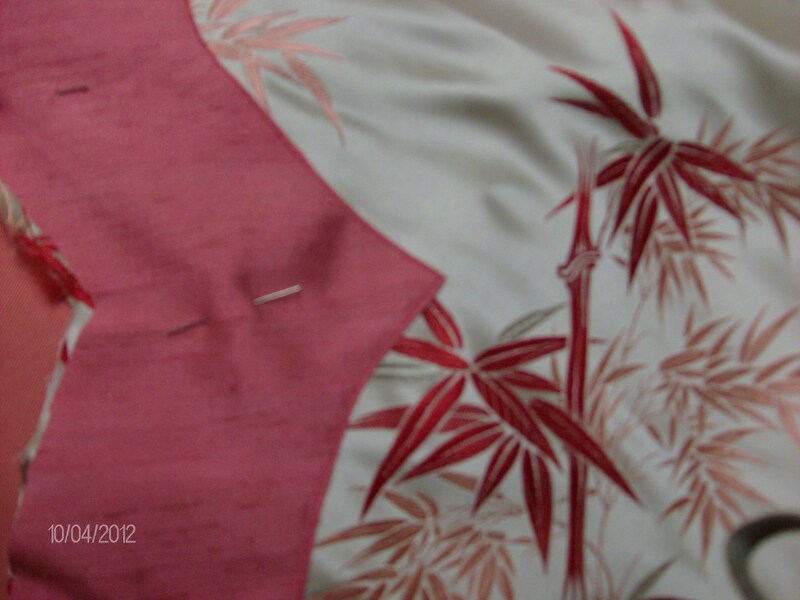 After cutting the required two sides and 4 gussets, I immediately sewed the gussets in, two to each half jacket. 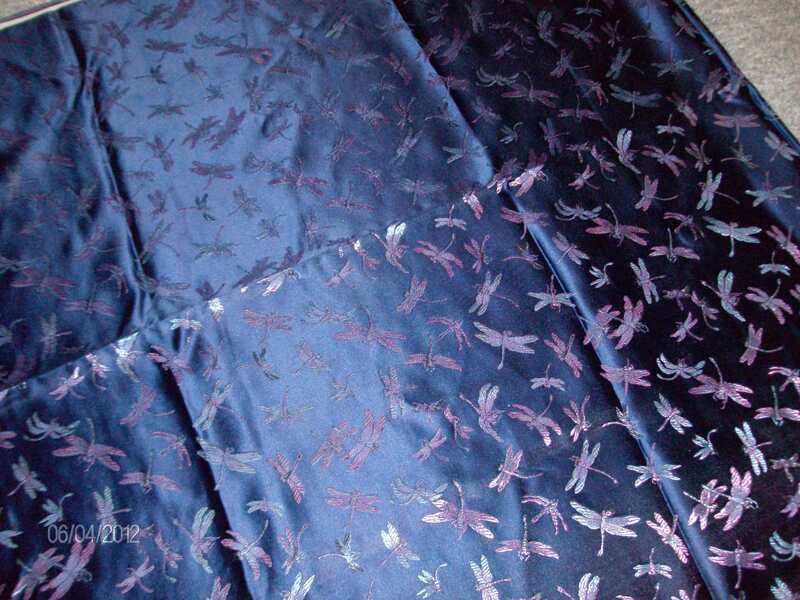 I was able to find a small piece of steel-blue Shantung (textured with flubs) silk which perfectly matched the blue in the dragonflies’ wings. After cutting it into approx. 10 yards of 2 1/2in wide tape, I gathered it all into a 3 yard length. 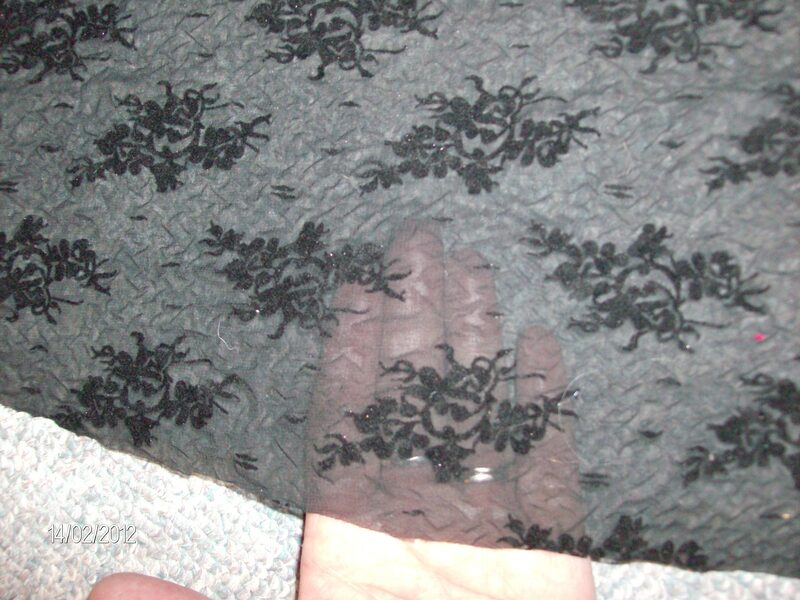 I got that number by measuring the width of the cuffs (following the pretty curve it has) and the length of the band (which is indicated on the pattern) along the front. This band doesn’t go around the back of the mantle. I got 108 inches, or 3 yards. After gathering it, I pressed it a little to help stop it from twisting about while it got pinned to the front and the sleeves. 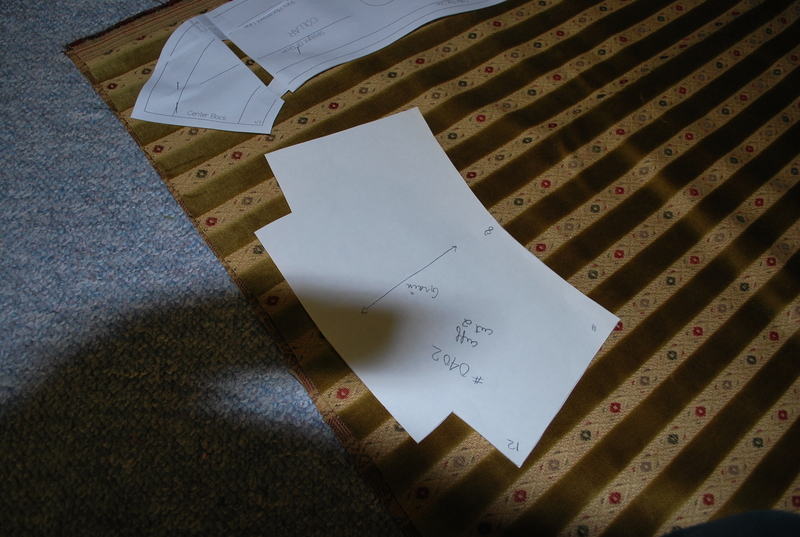 I marked the sewing line for the wide trim by sewing a long-stitched line at 2 1/2 in from the outer edge. 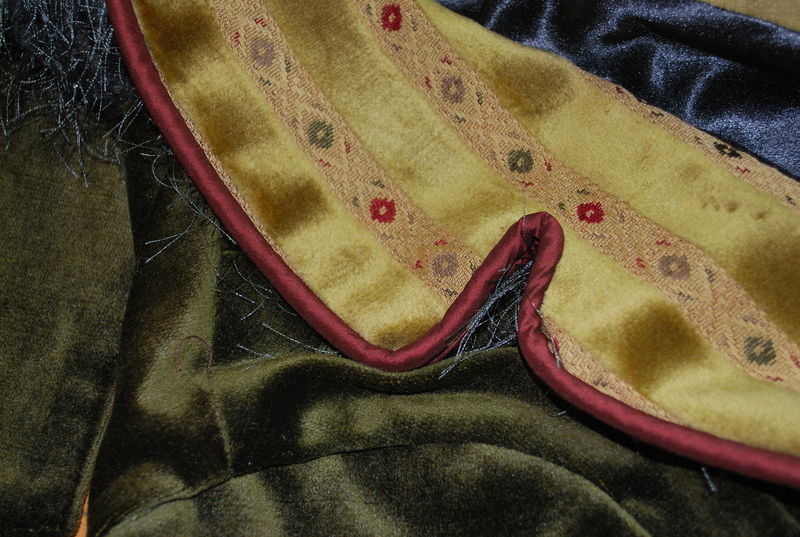 After placing the right side of the trim on this line I could then sew it fairly easily. 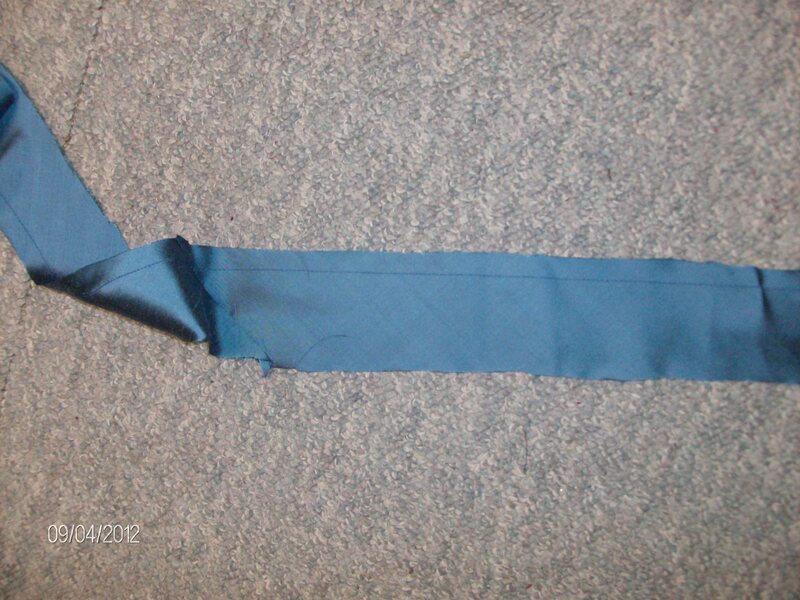 After sewing it down, I flipped it back and pinned the edge of the trim to the edge of the blue fabric and basted them together. 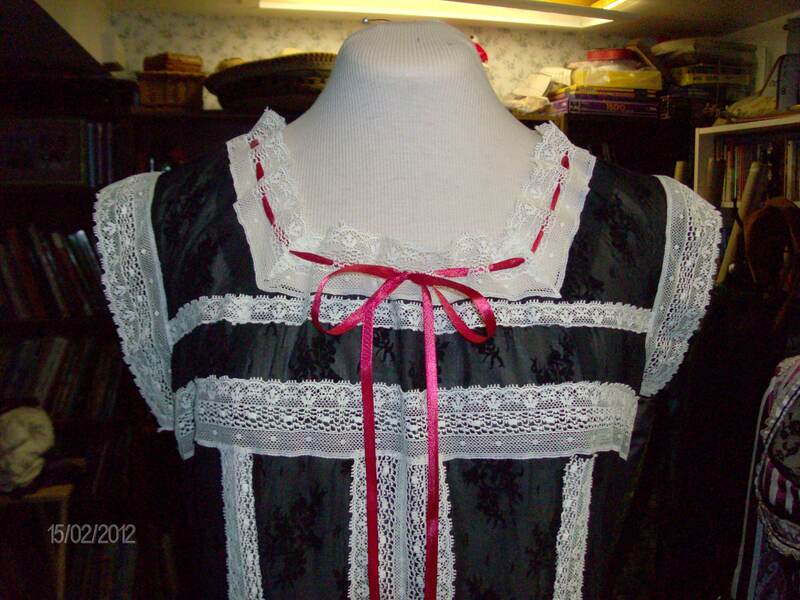 Here again, I changed the design by NOT adding another layer of fabric or batting under the trim. The gathers were puffy enough for me! 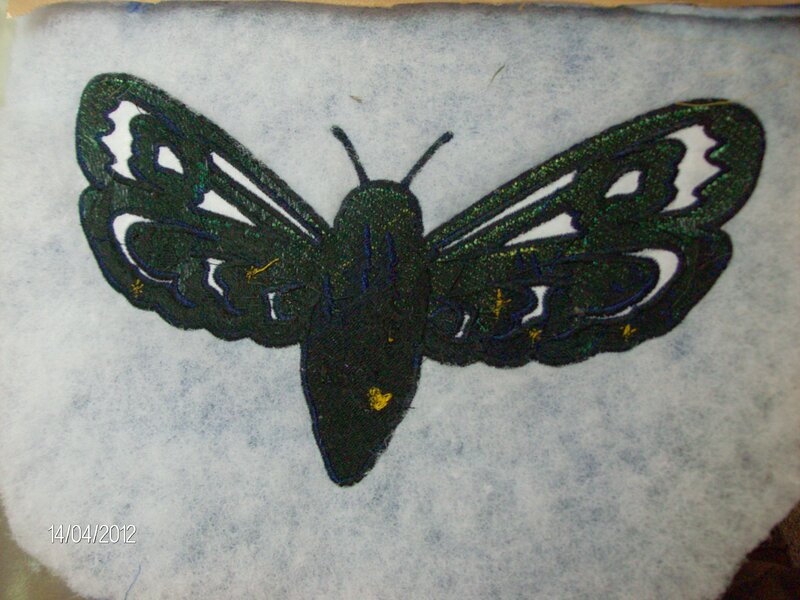 The two blues I chose for this side were right for each other but the colourway lacked *Oomph!*. 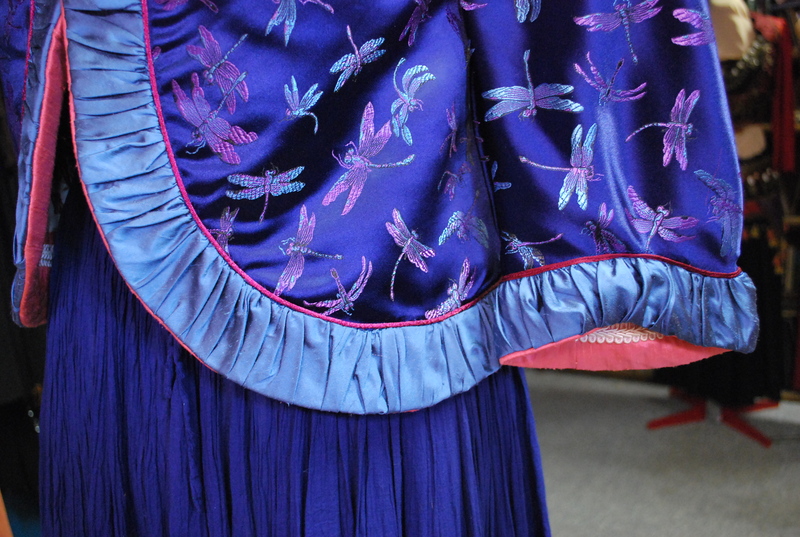 I dug out various braids and ribbons and at first chose a lovely violet 1″ braid to sew alongside the trim… but because it was braided and the trim was already rather textured by its gathers, my daughter pointed out that it seemed too busy… :-(. She was right. So I went in search again and pulled out a satin cord in a light red (as opposed to brownish) burgundy that helped pull out the pink and added a dash of life to the mix. 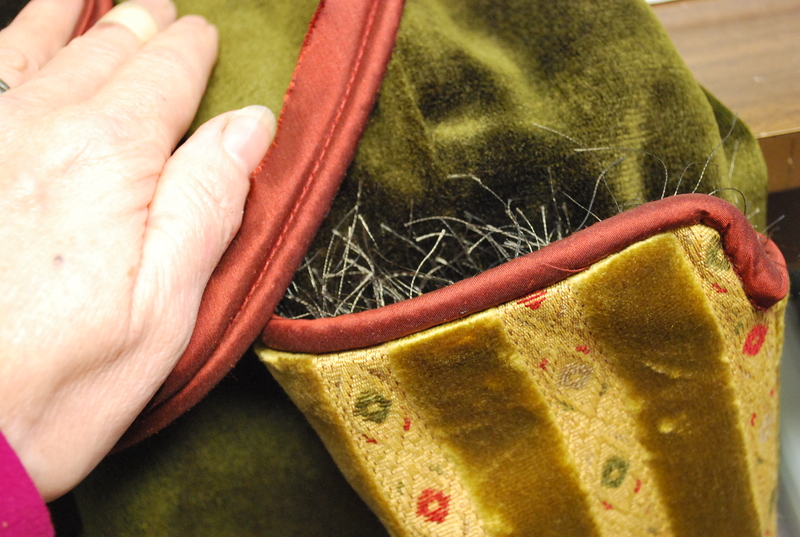 I then proceeded to sew the cord right up against the gathered trim with a narrow and long zig-zag stitch. 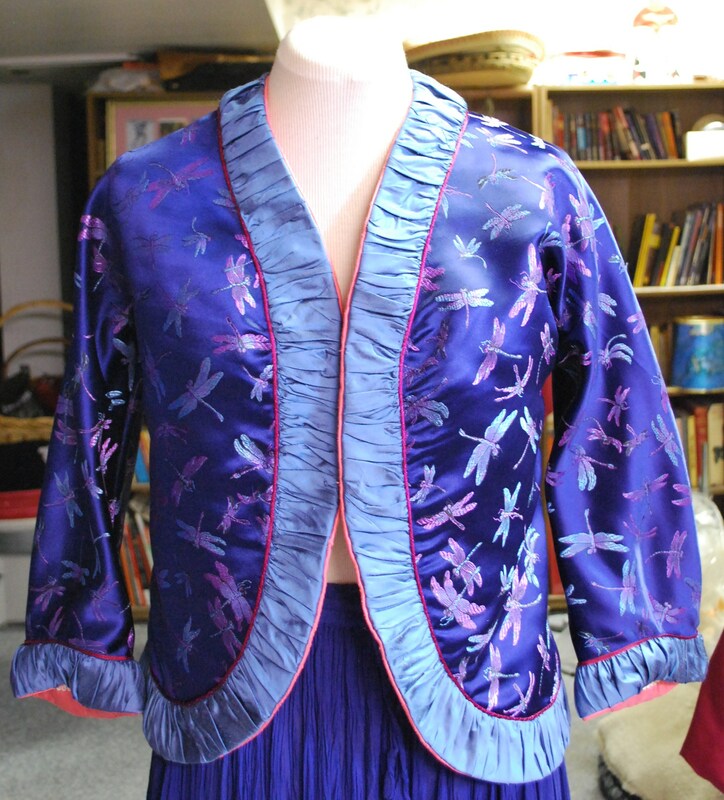 This is when I made each piece into 1/2 a jacket shape by starting sewing at the sleeve edge, along the sleeve, diagonally across the gusset and down to the bottom edge. 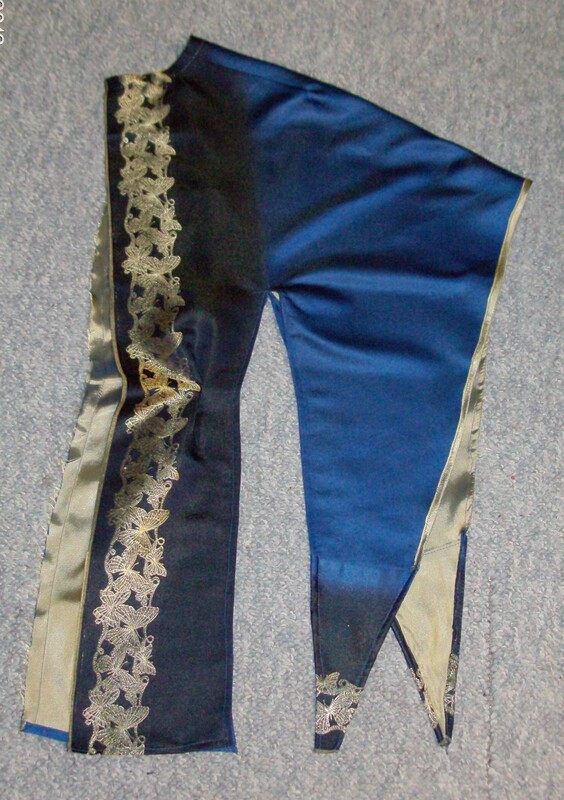 But I did not sew them along the middle back together yet. 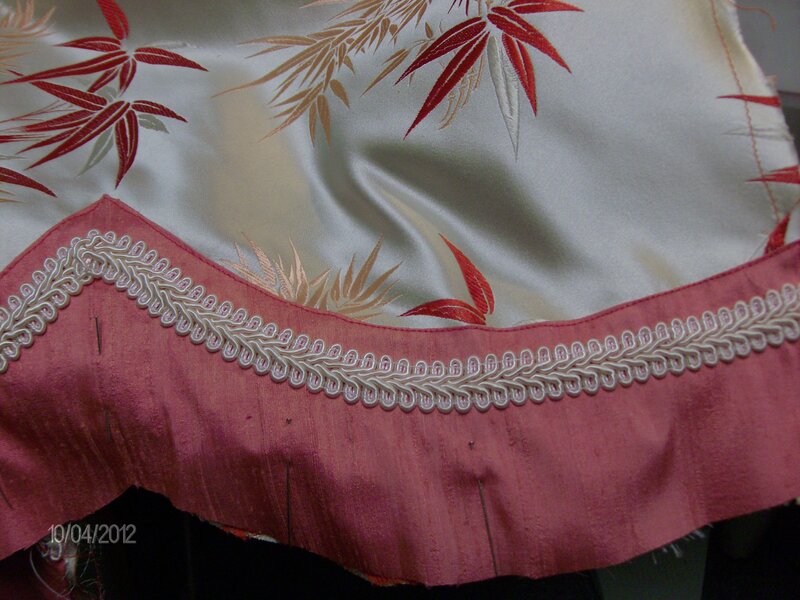 I chose to trim the coral side of the mantle with a Shantung silk in medium creamy orange. This was another remnant. It blended well with the smooth charmeuse finish of the background coral and two other brighter orange colours of the bamboo Jacquard silk. I didn’t want to gather this trim as the other side was already puffy enough. Again, I found that although these colours were made for each other, and maybe because of that, there wasn’t enough contrast. 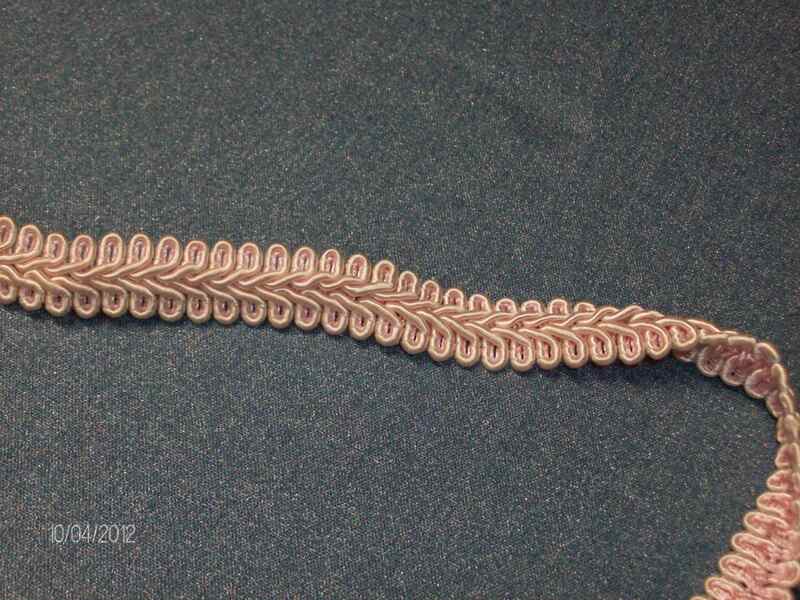 I went back to my braided trims and found a piece of very pale coral narrow braid, only 1/2 ” wide. My first idea was to sew it right on the edge of the Shantung, the same way I had done for the burgundy cord on the blue side. 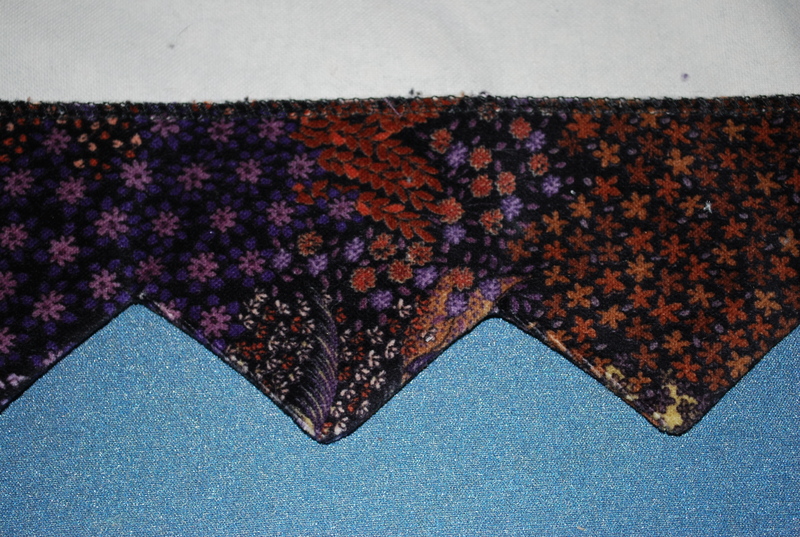 I changed my mind later on and elected to sew it 1/2″ lower than the edge of the darker orange Shantung. 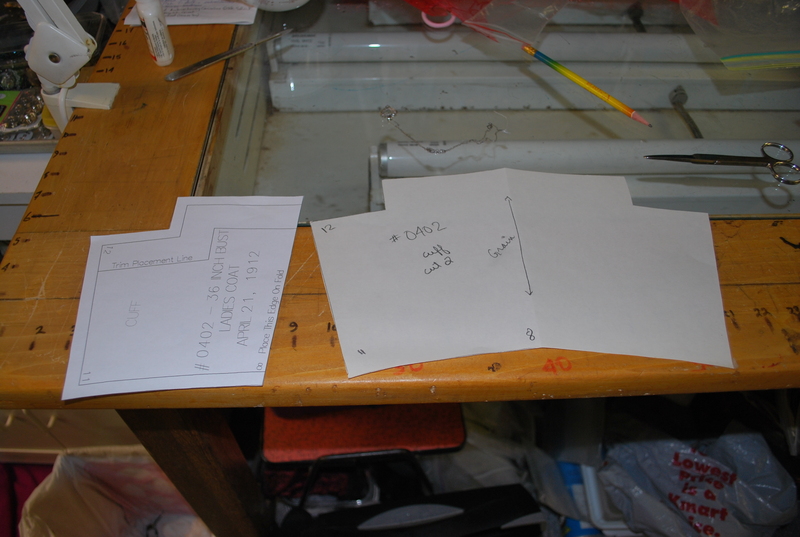 In order to have exactly the right size pattern, I simply traced the band shape from the front and the sleeve cuffs onto another piece of paper and added about 3/4′ to its width. (Pictures above show this step). Then I cut the orange Shantung trim. 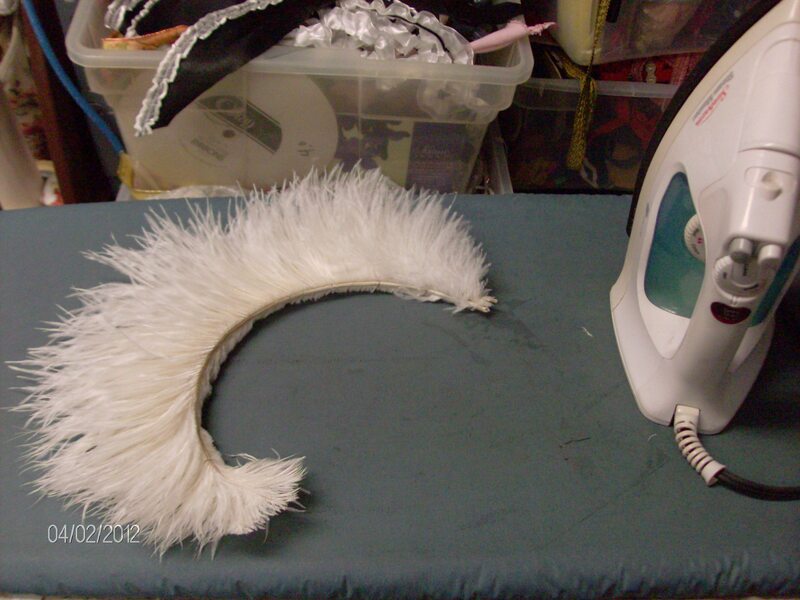 I ironed down 1/4″ the inside edge of this trim and carefully pinned it in place. 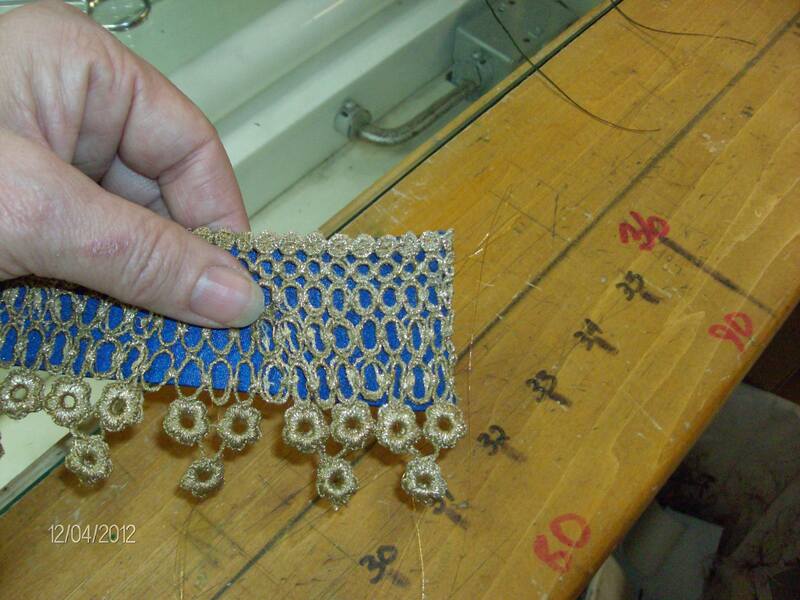 This band was top-stitched to the coral half-mantles before I applied the 1/2″ braid half an inch below its sewn edge. I felt it made it more dynamic that way. 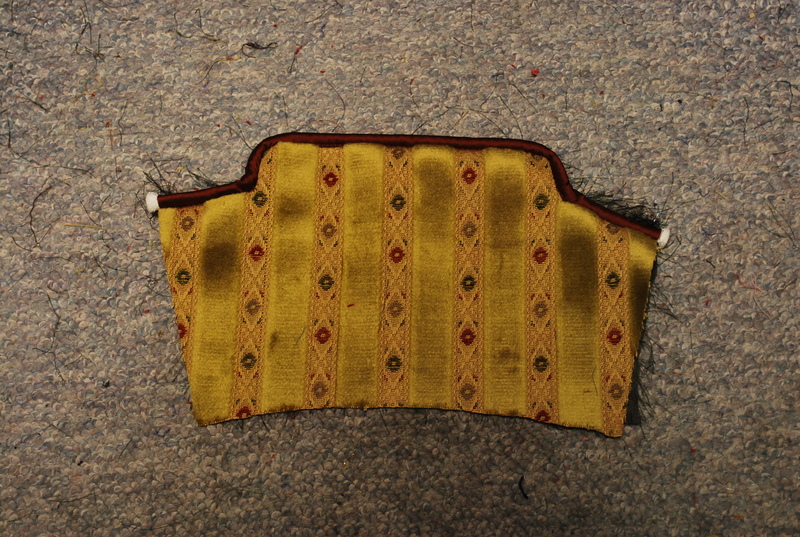 The unfinished edges of both the trim and the coral Jacquard were basted together. 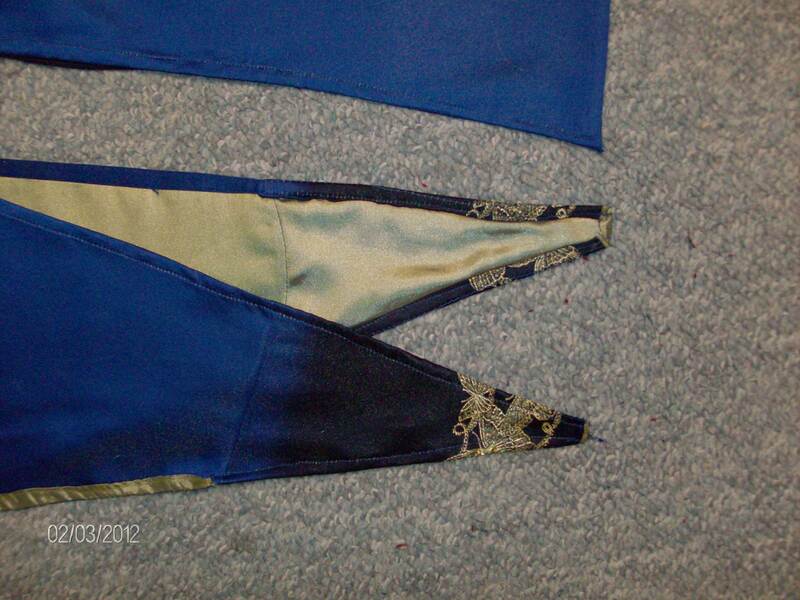 Then I sewed the seam making the sleeve down to the bottom edge of the mantle, the same way I did for the blue side. I now had 4 half-mantle pieces. 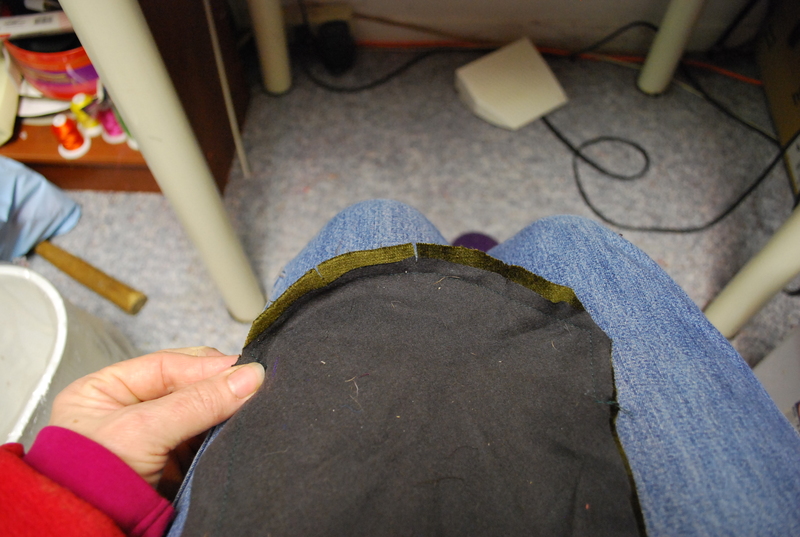 In order to sew as much as possible by machine… and have stronger seams closing the several layers of the cuffs and front edges, I had to sew the sleeve edges first, right sides together, by placing one jacket piece inside the other inside out. After sewing this, I pulled the blue jacket out through the orange jacket’s sleeve and found myself with half a reversible mantle! I did the same with the other side. After pressing all the edges to have them lie a little flatter and look cleaner, I proceeded to sewing the two blue centre backs together, changed the thread and sewed most of the two coral backs together. 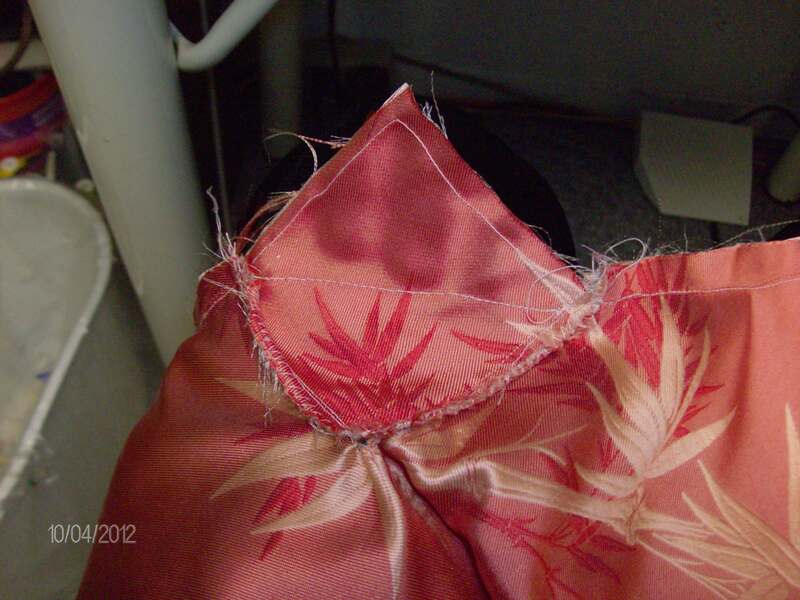 I remembered to leave a small opening to turn the jacket right side out and sewed up the remaining 4 inches by hand. 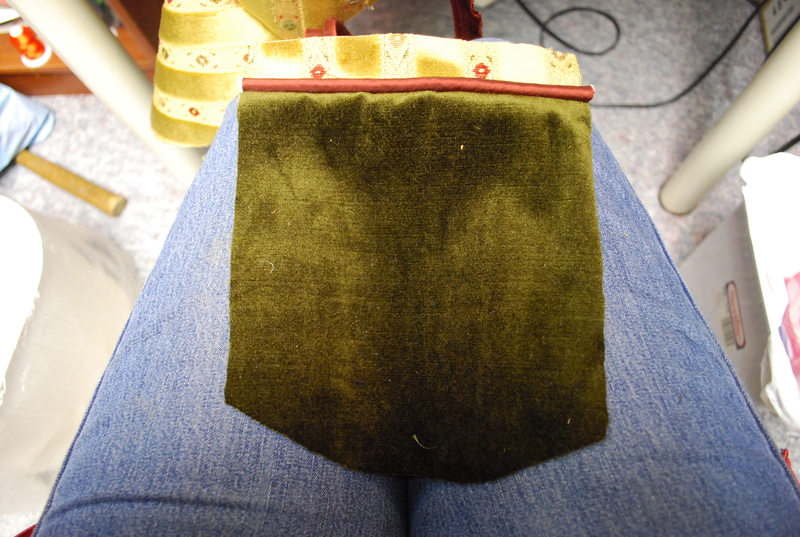 Another little steam press for the middle seams and my jacket was ready! Life has been rather hectic since my last post. Lots going on at home and everywhere else! 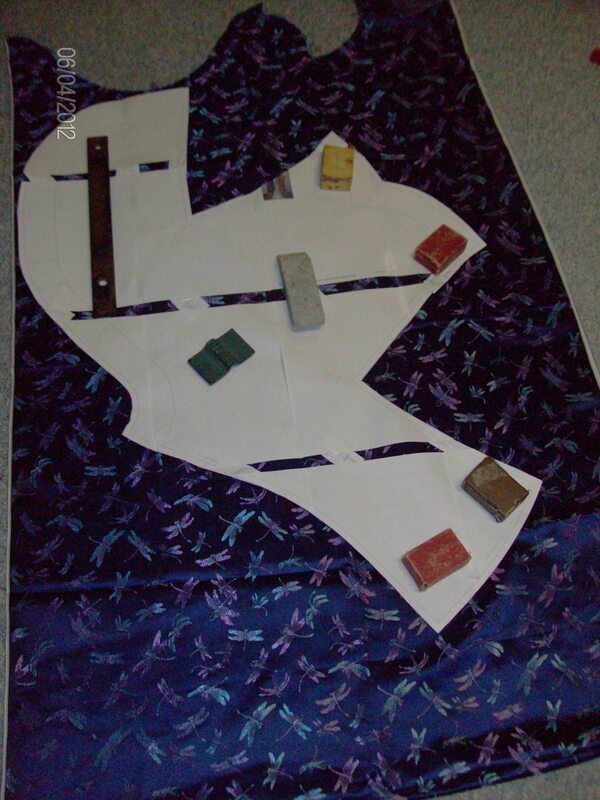 I received our Titanic Sewing Group’s first pattern last week on Thursday. 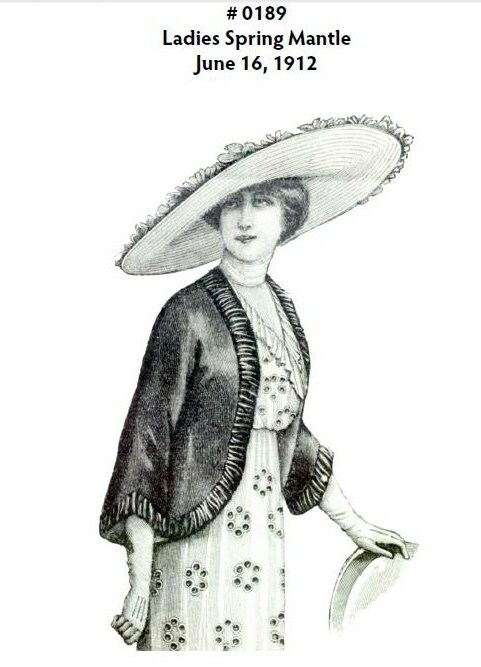 1912 Afternoon Wrap, pattern # 0291, from La Mode Illustree, found on the VPLL’s website. 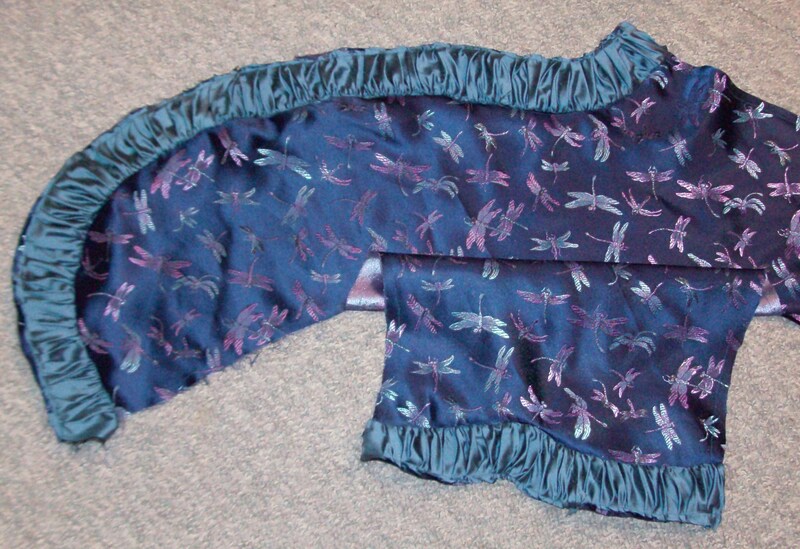 First thing I did was go to my private stash and rummage through that until I fell upon a remnant from a skirt/pant I made 3 or 4 summers ago from a lovely royal blue Jacquard light weight satin which goes to navy on both selvedges and within that darker part is a gold woven pattern of butterflies and scrolling. So the wrong side of this is just as beautiful as the right side… This explains why I chose to make the Afternoon Wrap without a lining. The flashes of gold add an interesting dimension to the outfit! Same as for the Challenge Pattern (the Princess Slip from my previous blog), I printed the pattern from a .PDF and reassembling it was easy. 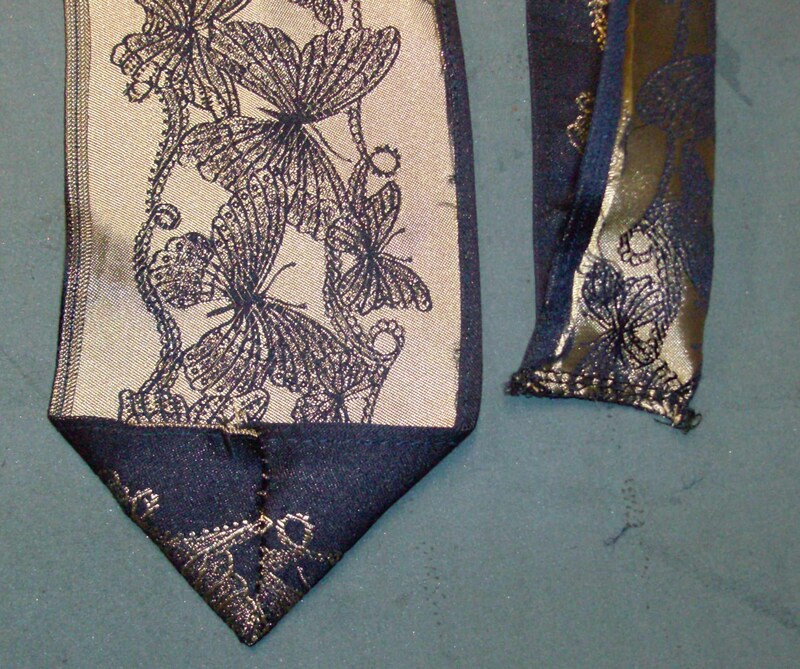 We were provided with a cutting layout and I saw that it showed cutting the two main and the four collar pieces separately on a single layer of fabric and realized that they had been placed incorrectly. Another Lady in our group brought that up yesterday… before I had a chance to report on it. 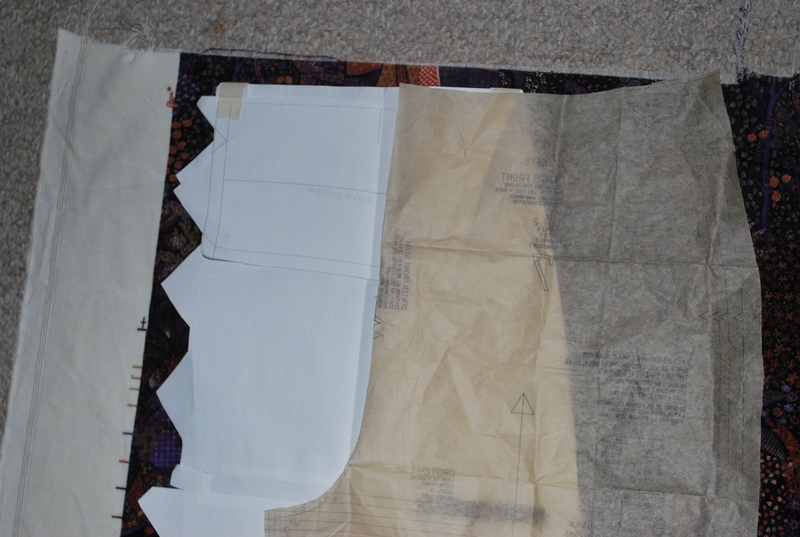 I passed over that as I intended to cut these pieces on a folded piece of fabric, that way only cutting one large main piece and two collar pieces. As long as either the two right or two wrong sides are touching, the pieces get cut correctly, that is: mirror-image of each other and you are ready to assemble them. I stay-stitched all the pieces. It means a lot of work removing some of that later, but prevents the pieces from changing size as many of the edges are on the bias or other than straight grain of the fabric. Another change I made was to lengthen the back and front parts because again, after measuring, I saw that the hem line would lie across my widest part, and I don’t particularly want to put a spotlight on it… (I must confess that lately, I prefer to wear slightly longer t-shirts, vests, sweaters and jackets for that reason too.) As I was cutting the pieces out I was thinking of the trims and other decorations I wanted to use. 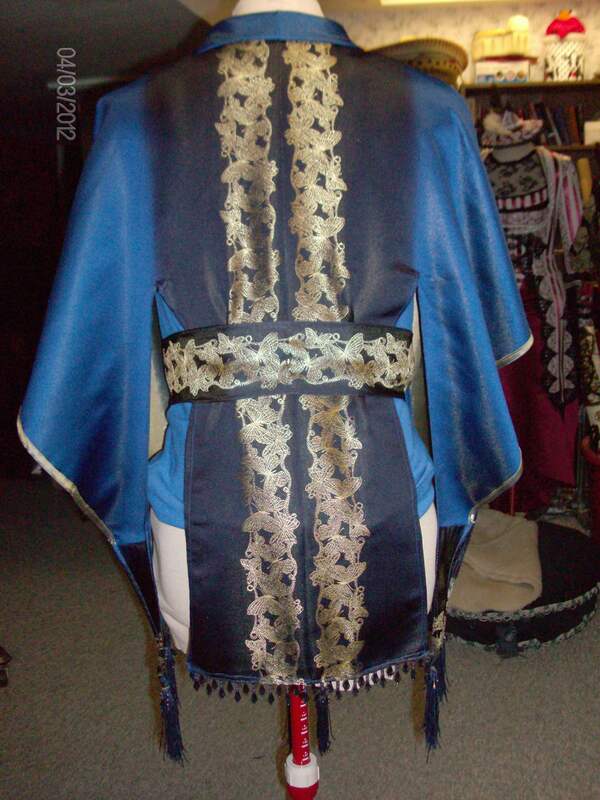 The pattern called for making a belt and adding tassels to the sleeve points. 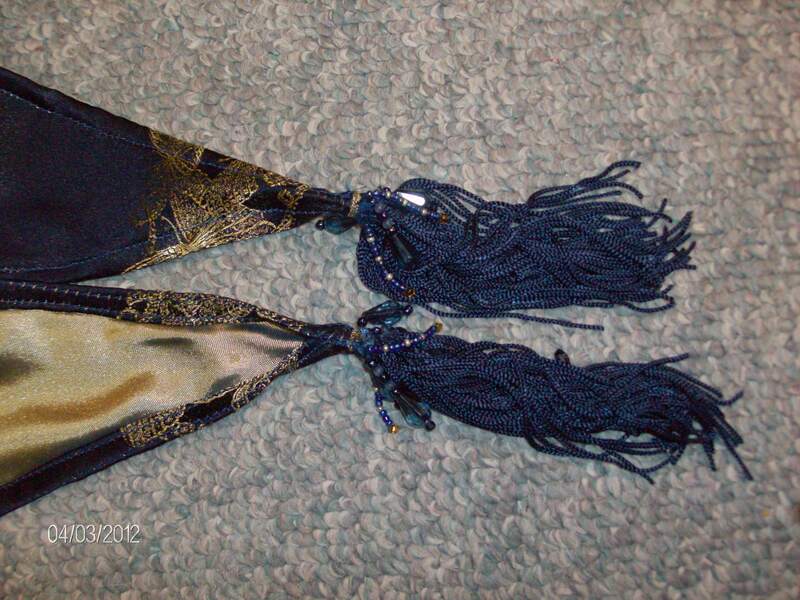 As I didn’t have any ready-made tassels but did have a bit of matching dark blue satin fringing, I chose to make the tassels with that and embellish the tassels with beads. I have been beading for years as well and to put it mildly, I have beads in many colours, textures and sizes and shapes. (Being a sewer for the last 40 years, and a collector of *bits*, I have a large selection of many things to use when I don’t have exactly what is required.) 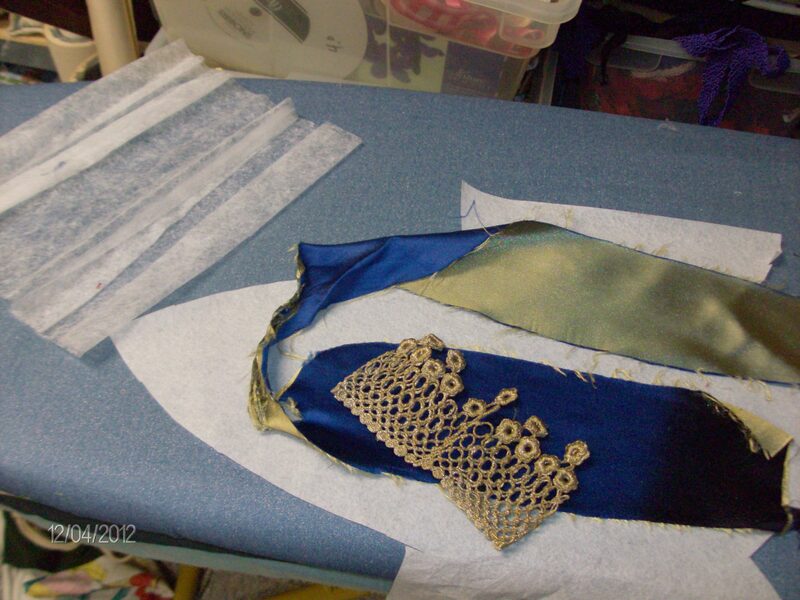 Depending on how much fabric border would be left over, it would be used to make the belt. If too short, I would make a buckled belt as suggested but I was hoping it would be long enough to make a tied belt that would have long hanging ties. 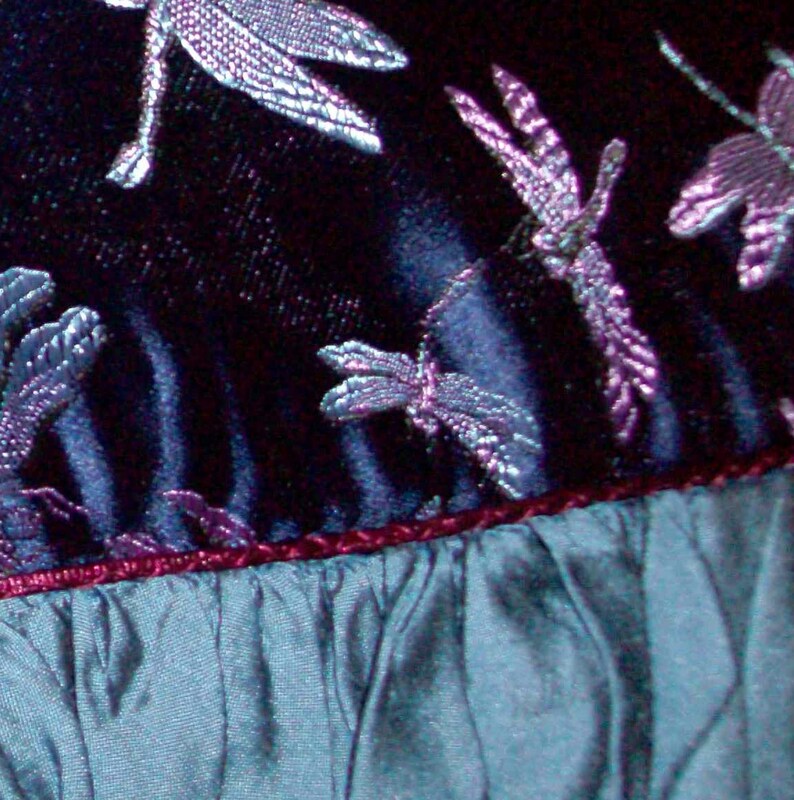 Tassels sewn to the point by rolling the hems over the crown of the tassel. 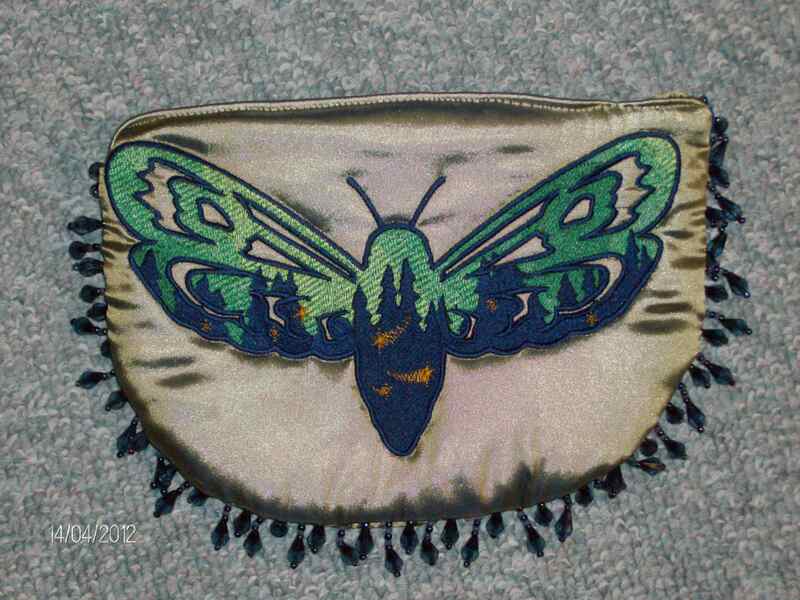 I wanted to spotlight that lovely border as much as possible, so turned the pattern piece 90 degrees making the centre back sit along the selvedge and the butterflies would be going up and down my back, rather than across it and the front pieces. 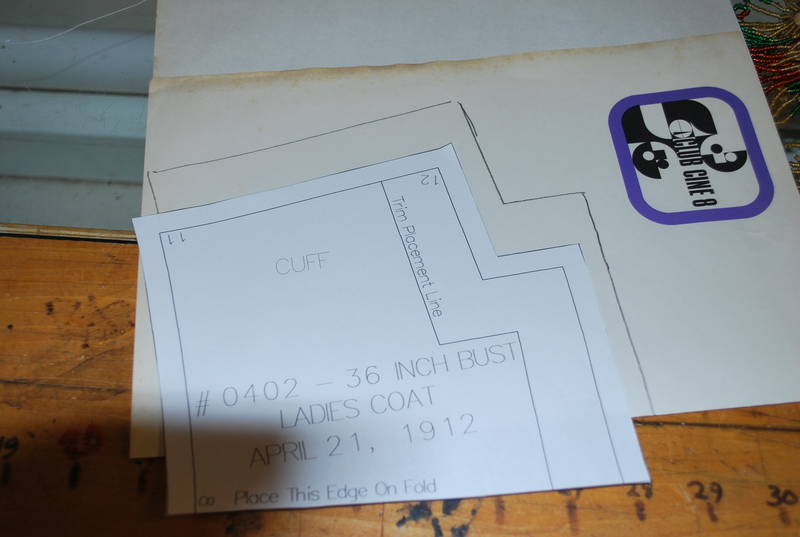 The instructions included adding an optional band on the sleeve edge. 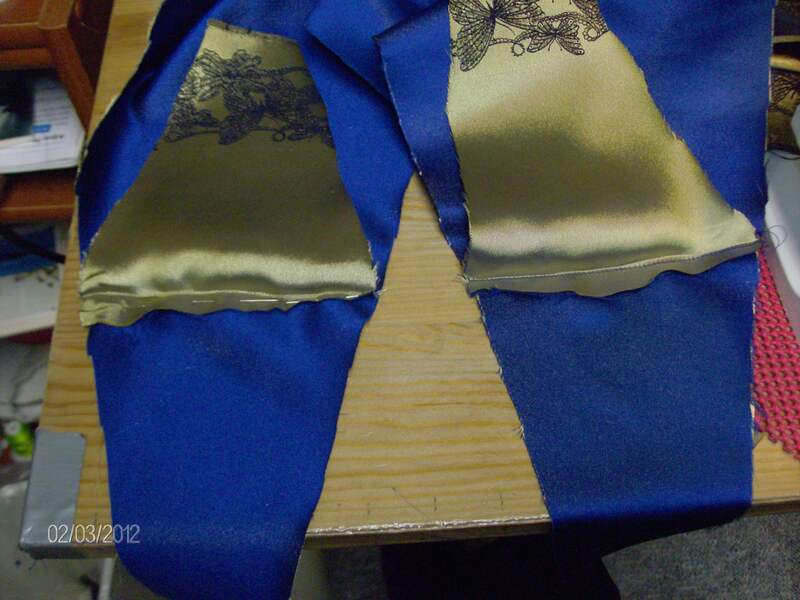 Rather than add another layer of fabric to the sleeve edge, I decided to turn up the hem using the gold wrong side outside at the hem which added only a narrow detail instead of the wide one suggested. 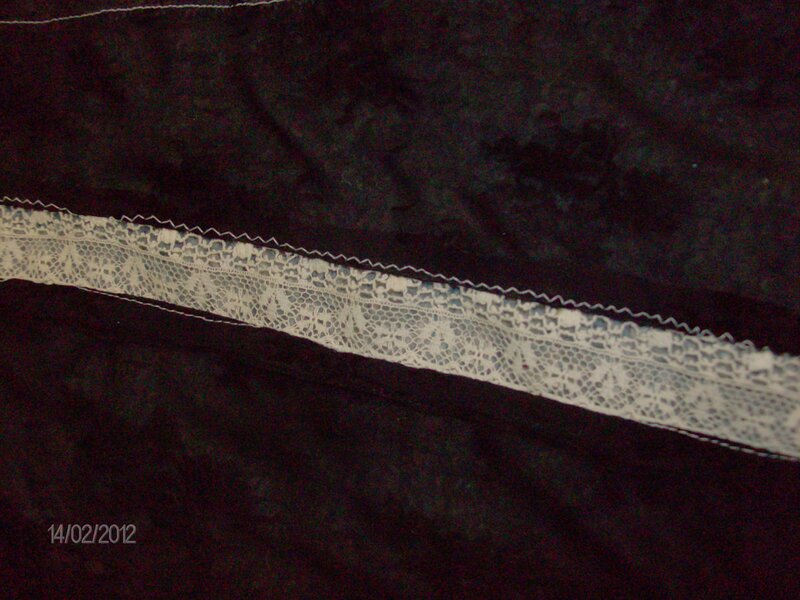 You can see the wrong-side-turned-out hem and the point which is covered with the selvedge border. As I looked at the sleeve, it occurred to me that if it was going to have a nice gold edge, it should also have more decorative points. 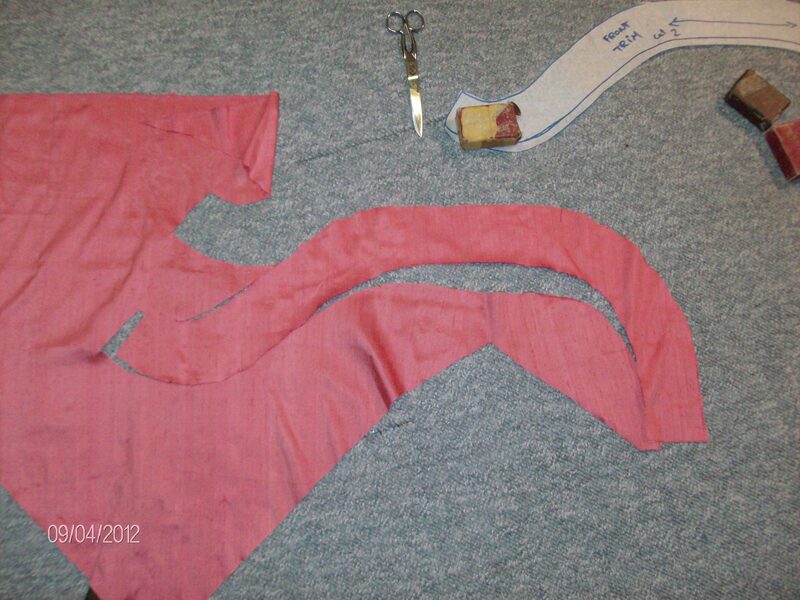 After cutting enough border for the belt, I found that I still had enough border length to cut four points from it and add them to the points of the sleeves. 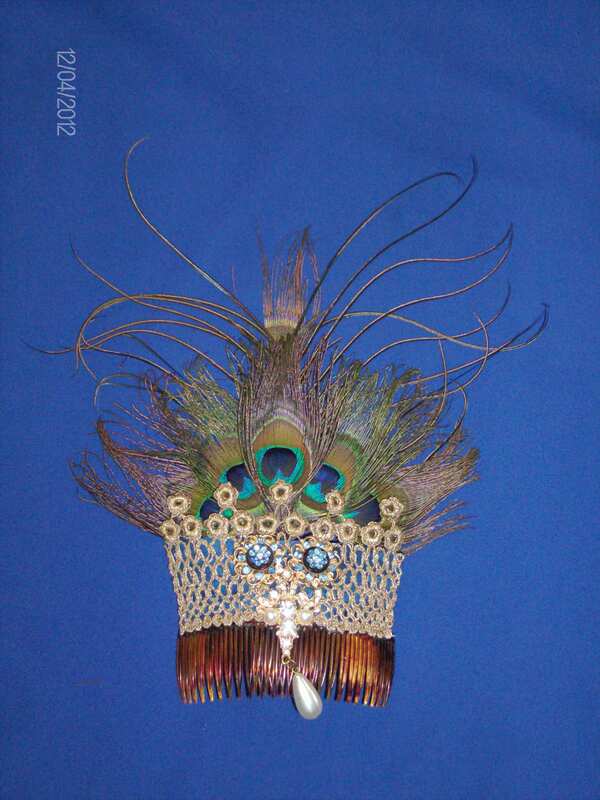 It gave the points the same fade from dark blue to the royal blue as the hem had and would decorate the points a little more than having just the tassels hang from them. 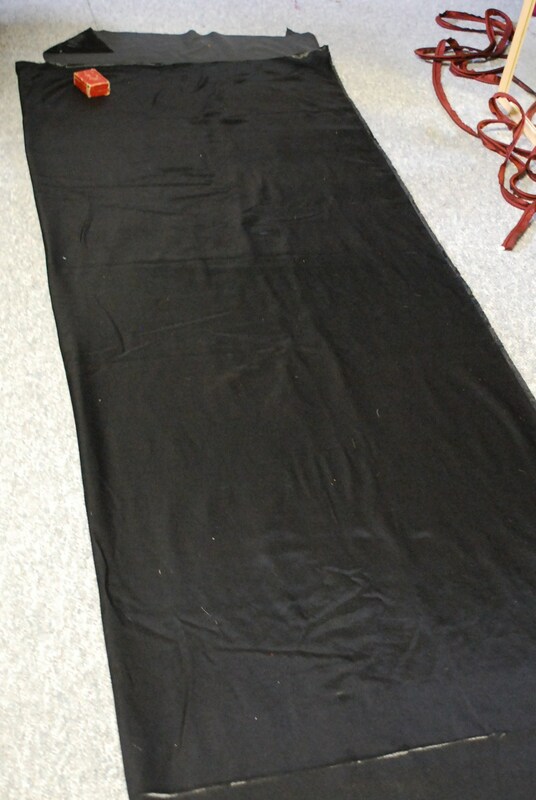 This was also good for adding some weight to the points because the fabric was so light. Clean finishing the top of the triangle and sewing it to the end point was a quick job. 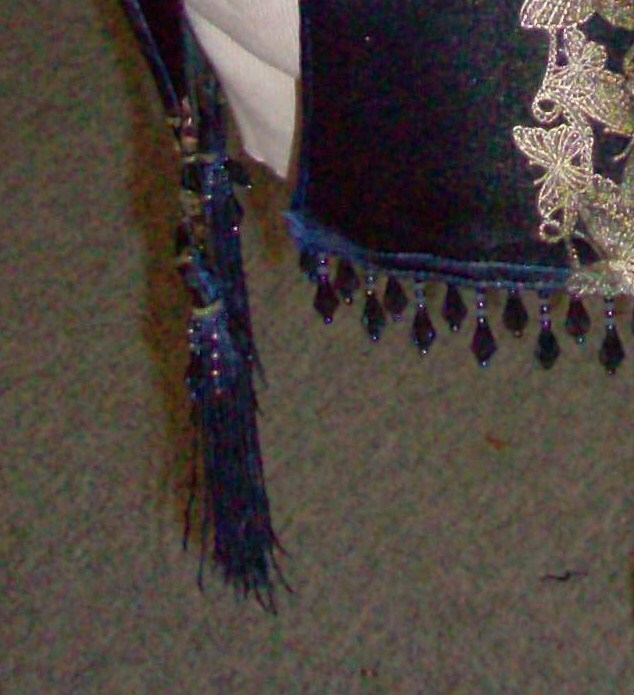 When I turned the hem there, the two layers here turned over together to make a stiff heavier point which would be stronger to support the beaded tassels. 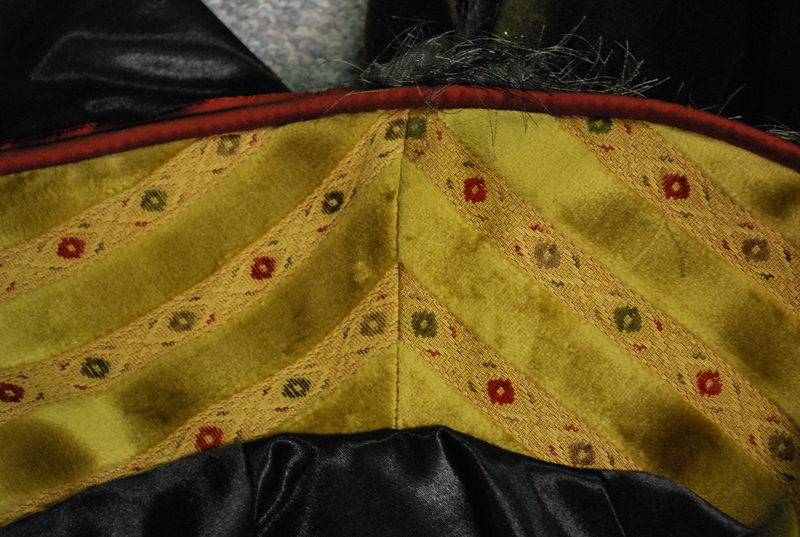 On the left you can see the one point still pinned in and the second point has been sewn across its top to clean finish the new triangle. This is what it looked like before turning the hem. 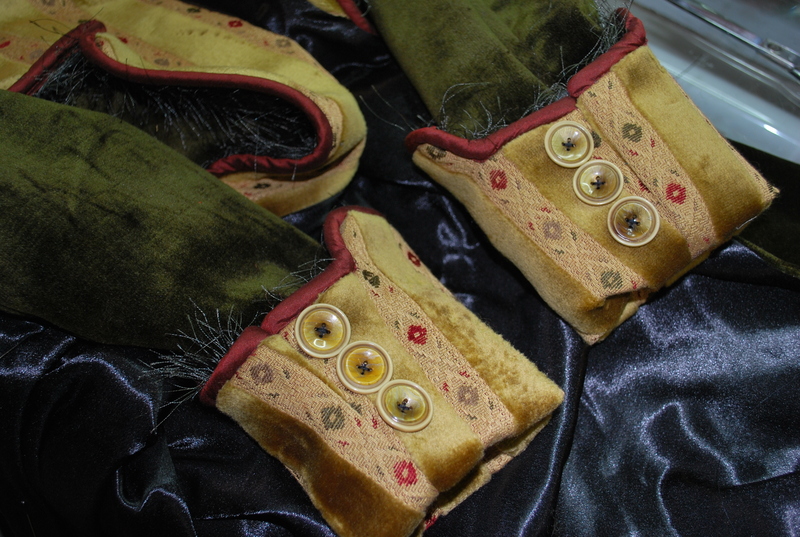 Here are two of the sleeve points finished but before having added the tassels. 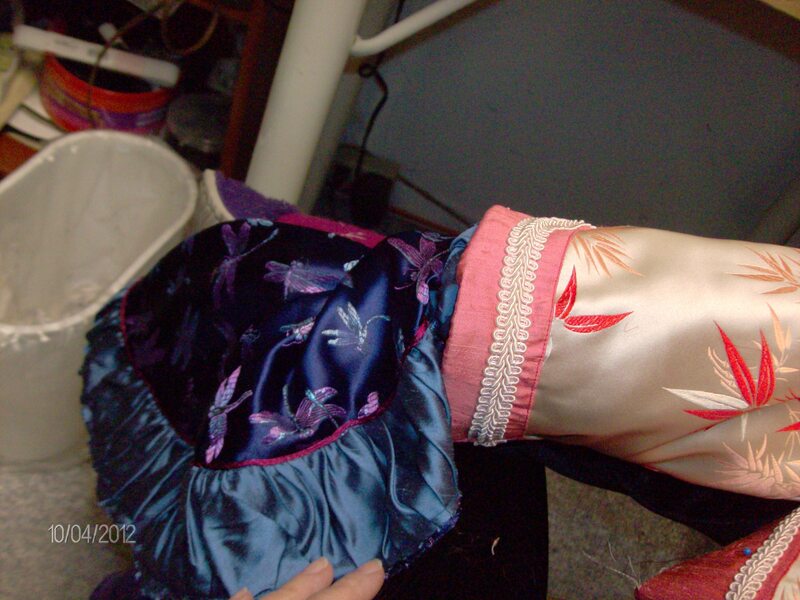 I made the pleats and sewed the darts first making sure everything was lying in the right spot with each piece. 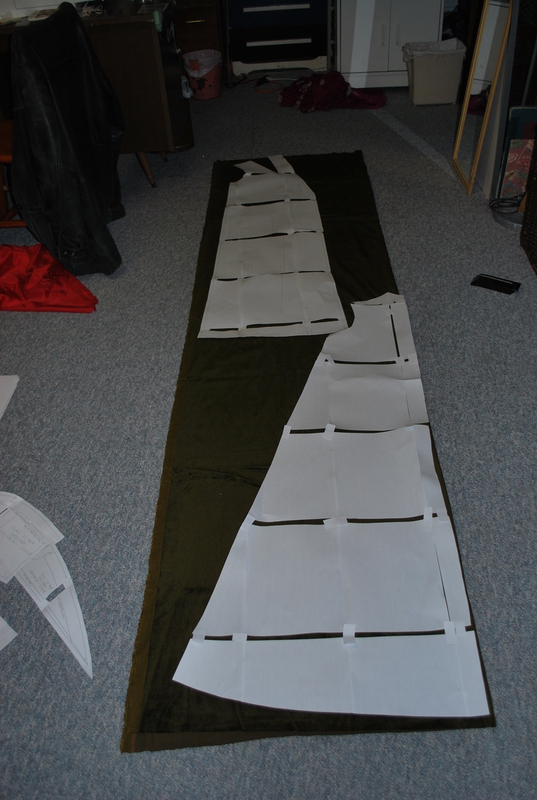 Then assembled the two main body pieces by sewing the centre back seam, as per instructions. 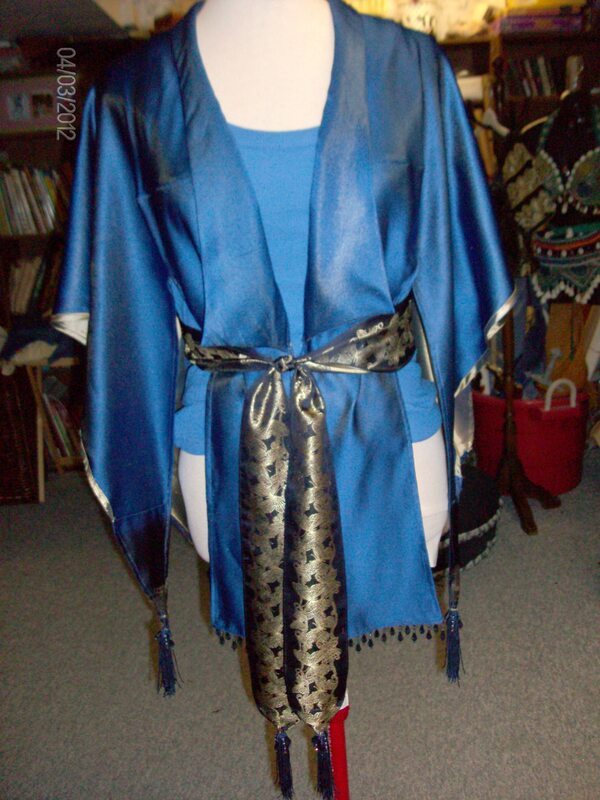 The collar was equally easy to assemble and add to the wrap. 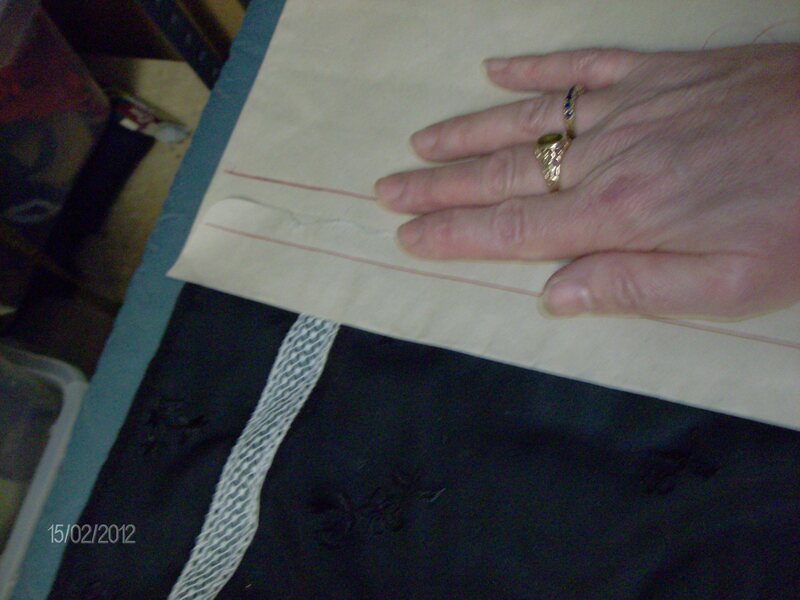 Pictured at left below is the front pleat on right half bodice at waist line. 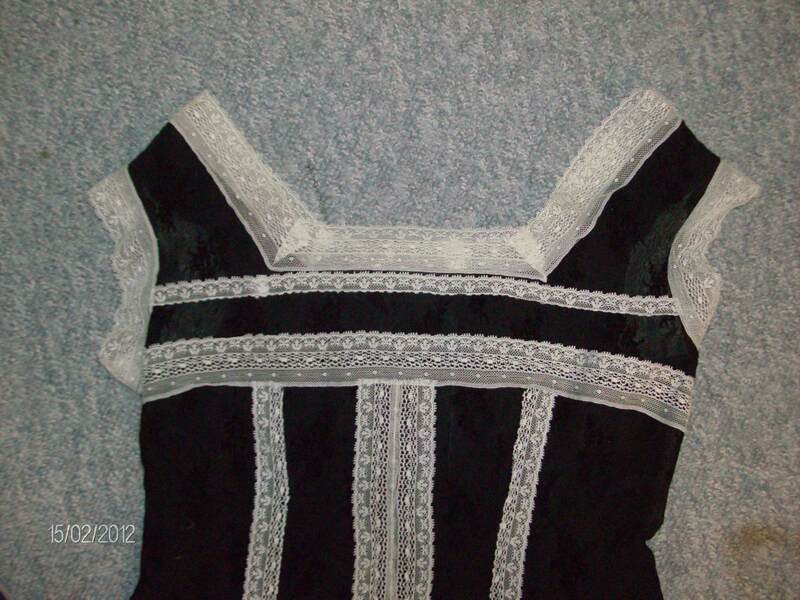 The next picture shows the pleat on back bodice. 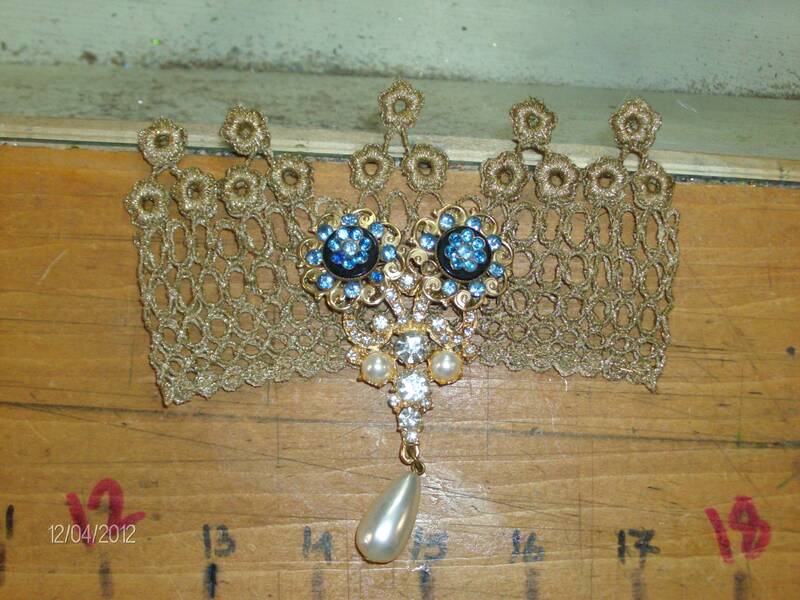 Using the border for the belt made a rather ornate belt. 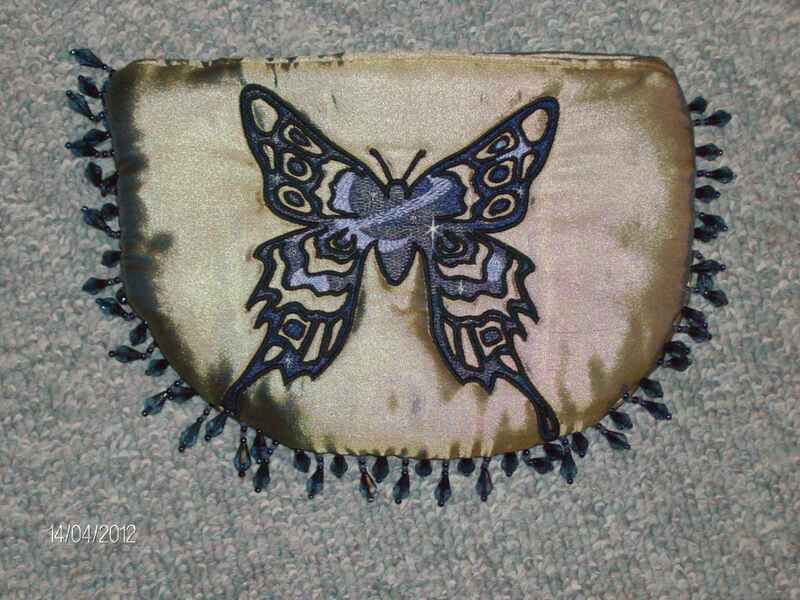 That was another reason for not using the order butterflies on the collar lapels. 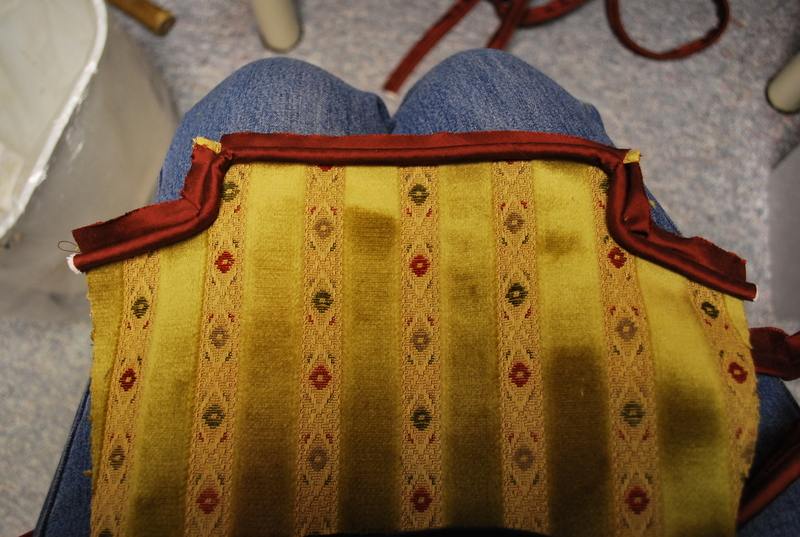 I simply turned the two edges of the belt length under using the rolled-hem foot on my machine. Below is the wrong side of the belt piece. 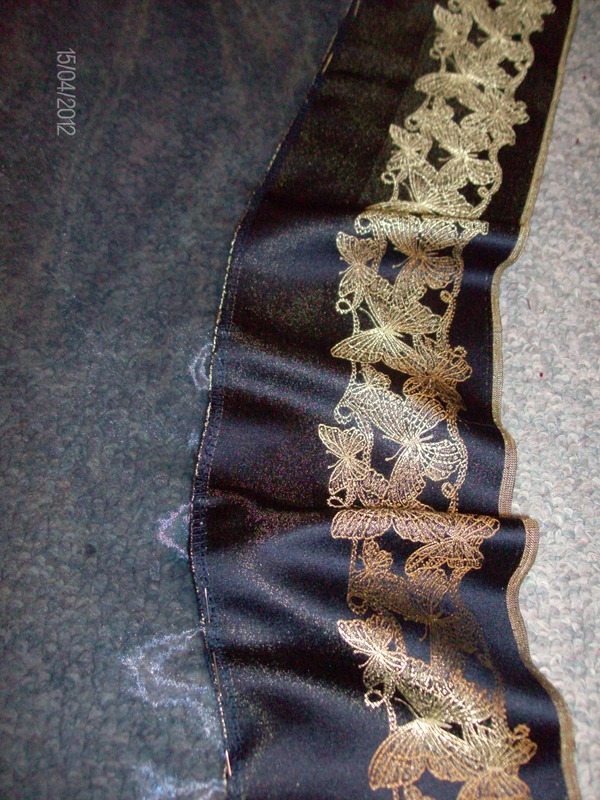 I wanted to see the wrong side of the fabric too, in order to use the gold flashes that would appear as I moved. 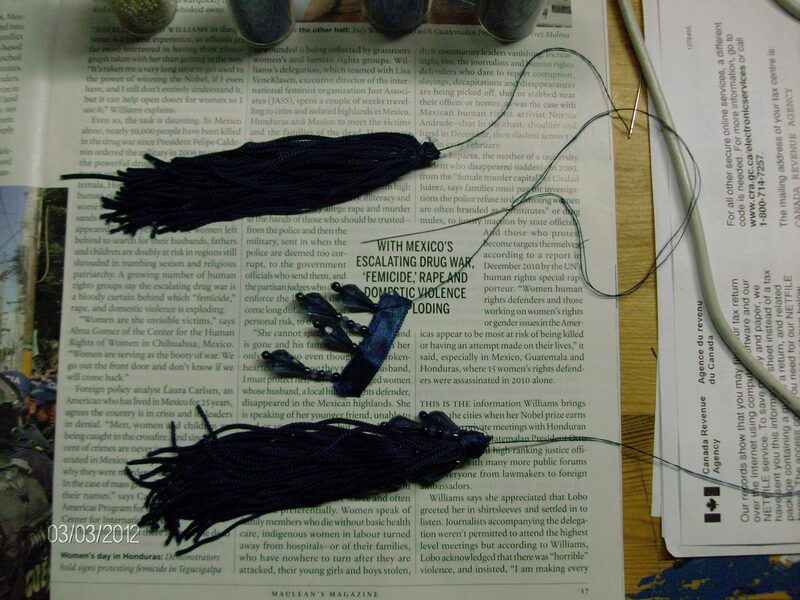 I didn’t want to use a buckle: that’s when I decided to make two more tassels for the belt ends. I shaped the square ends of the belt into triangles and sewed the tassels to the points of the belt, reflecting the sleeve points. 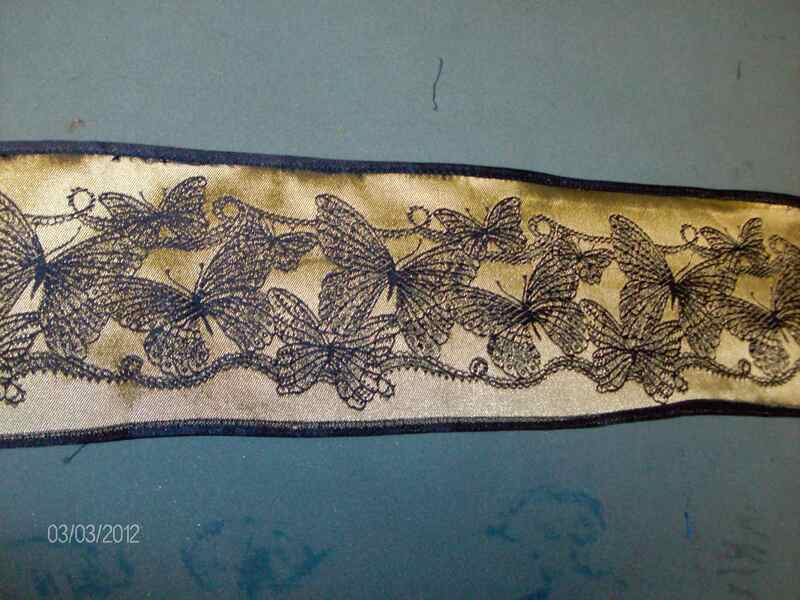 The belt was then sewed to the middle back seam at its middle and everything was pressed once more. 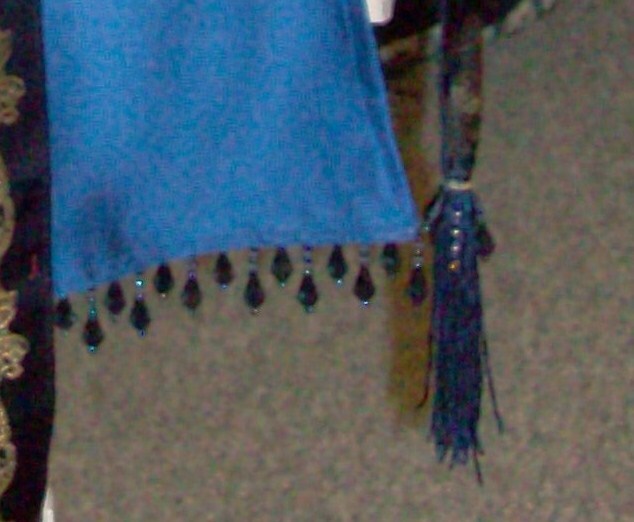 After beading the tassels, I made a beaded fringe with the blue beads which I then sewed to the front and back hems of the wrap. 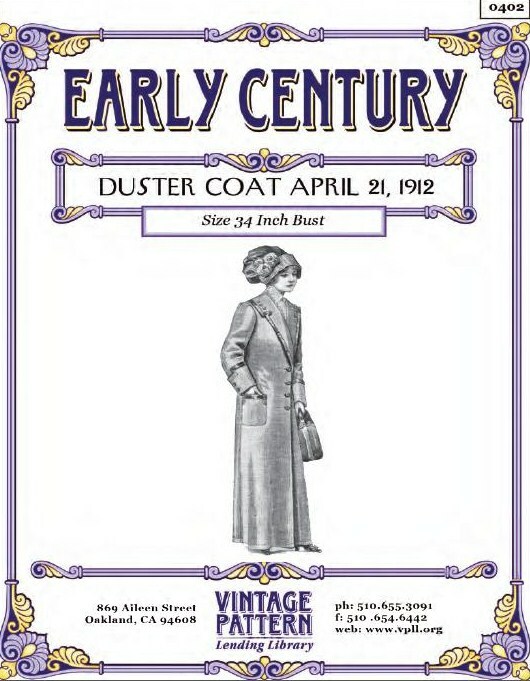 This all made it a little more formal than may have been used for an *Afternoon* wrap in 1912 but I may only use the wrap with the skirt on cooler evenings in the summer. I don’t wear that pant/skirt in winter! 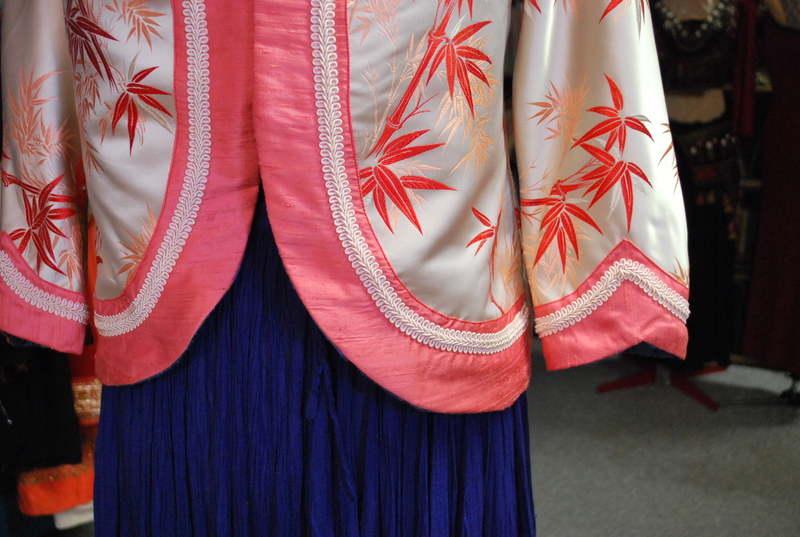 The very next two pictures show you the beaded fringe on front and back. 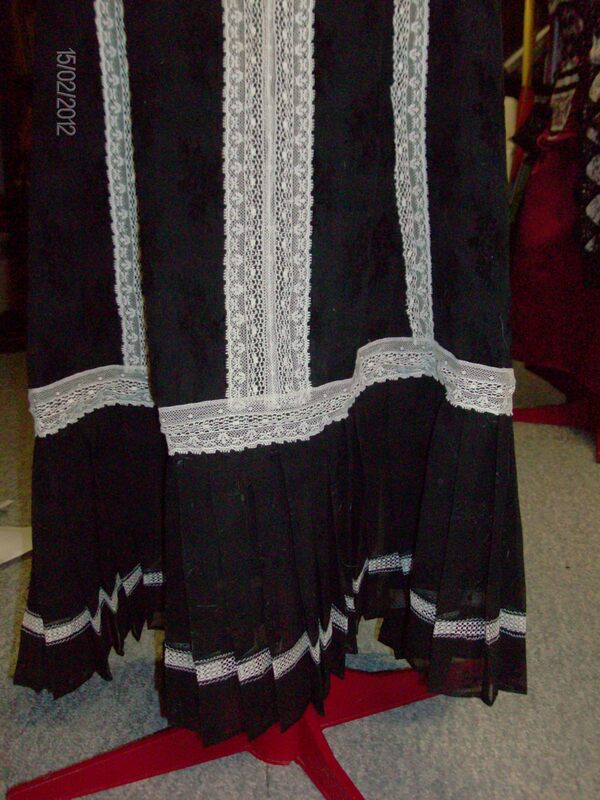 The bottom pictures are front and back views of the entire outfit with the long-ago made skirt. 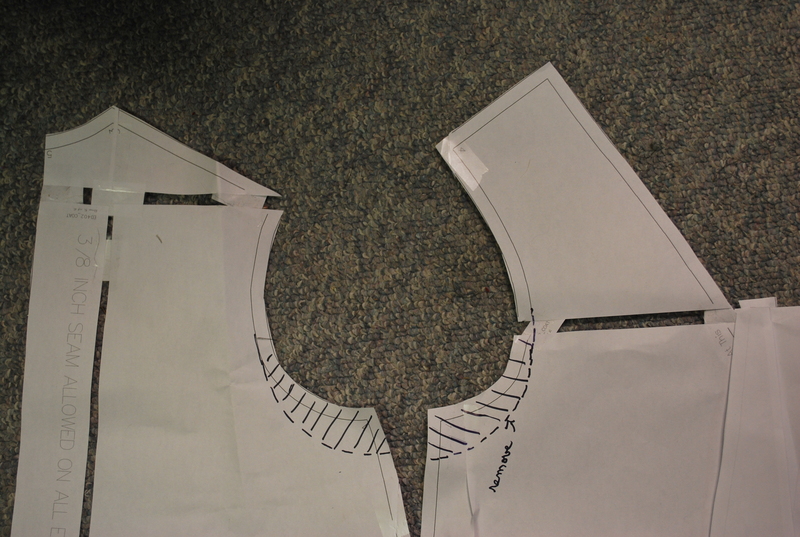 Now that it is done, I feel the slashed points of the sleeves near the bodice front need re-enforcing. So I will be adding a self bias strip stretching 3 in on either side of the opening. And… I am pretty sure I will make this wrap in the same fabric used for the Princess Slip made to be a nightgown two weeks ago. 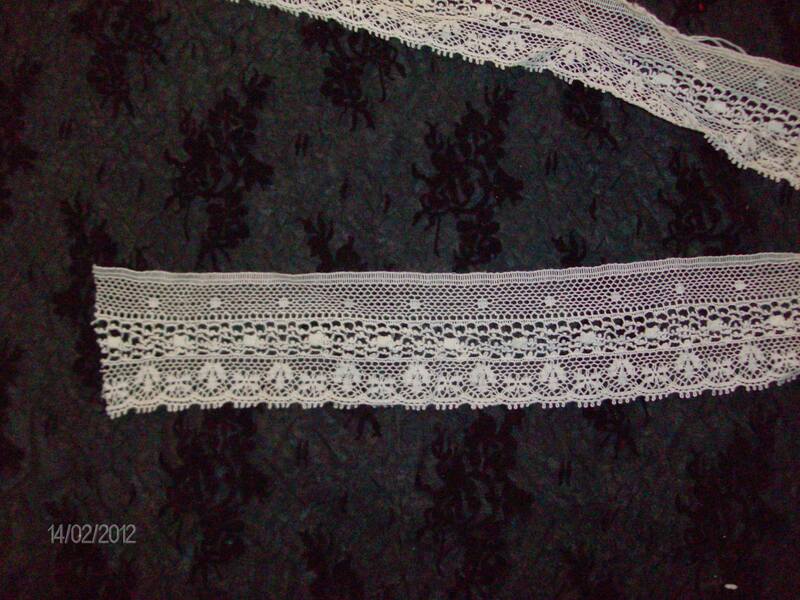 Again, I will lengthen the front and back pieces and I will use the same lace as the gown for the sleeve edges. Instead of a belt, I will use buttons. It will be lighter than a bathrobe and give the nighty some extra *modesty* when not in bed, heheh!! 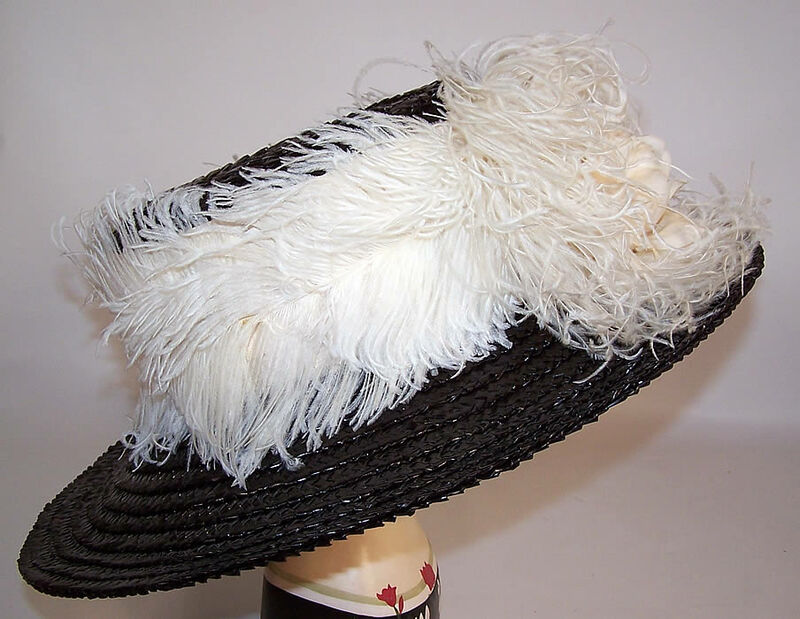 This is the hat that inspired my splurging on buying ostrich feathers and transforming a lovely wide-brimmed hat I already owned into a 1912-style Feathered Hat. 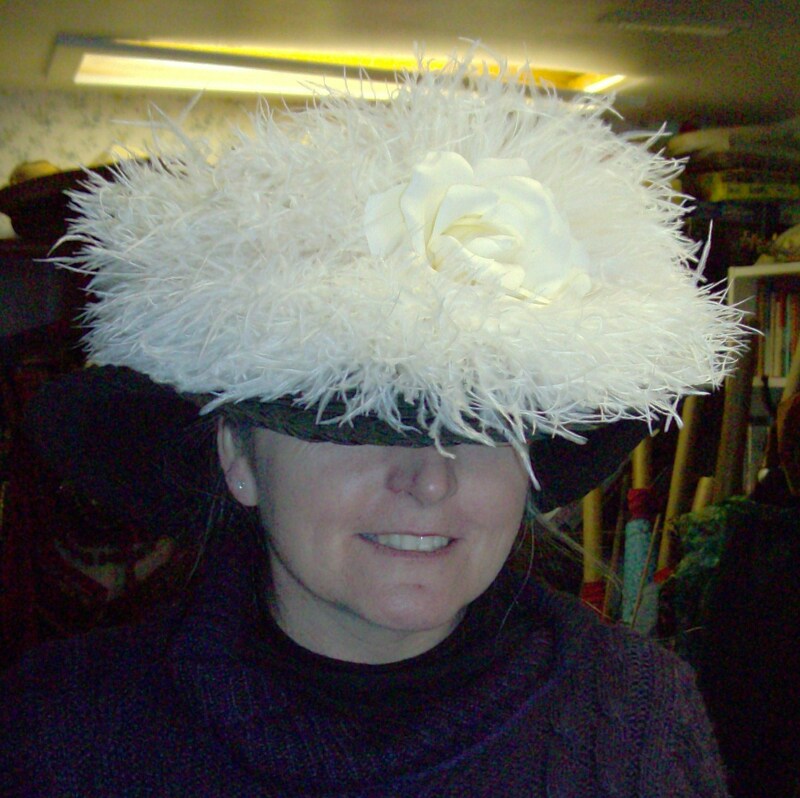 The new hat may not be suitable for gardening!! It is almost finished and as it stands it looks a little fancy for mucking about the pond and other about-the-house activities! There may be very few occasions when it will be perfectly suitable. 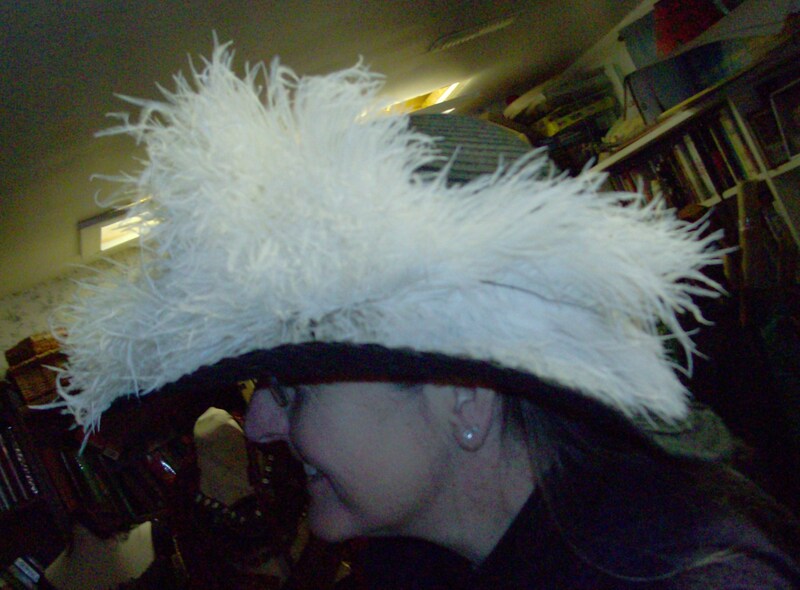 But now I own a perfectly decadent Ostrich Feather Edwardian style hat! 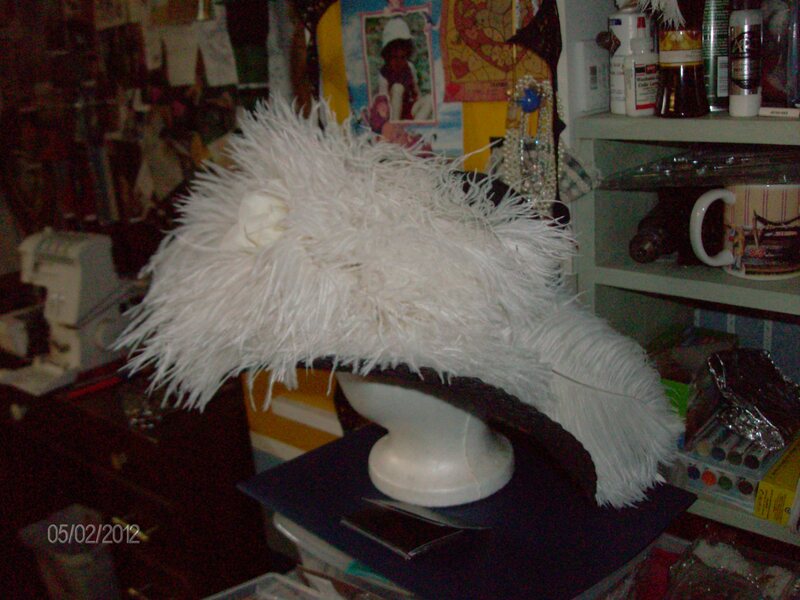 My hat has a rounded crown but will still be good for the project. 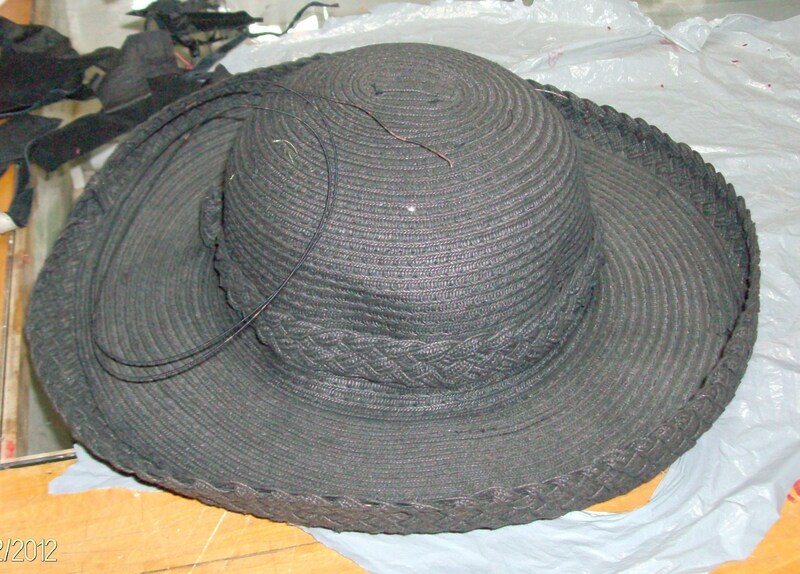 After wiring the edge of it, the hat sat better. 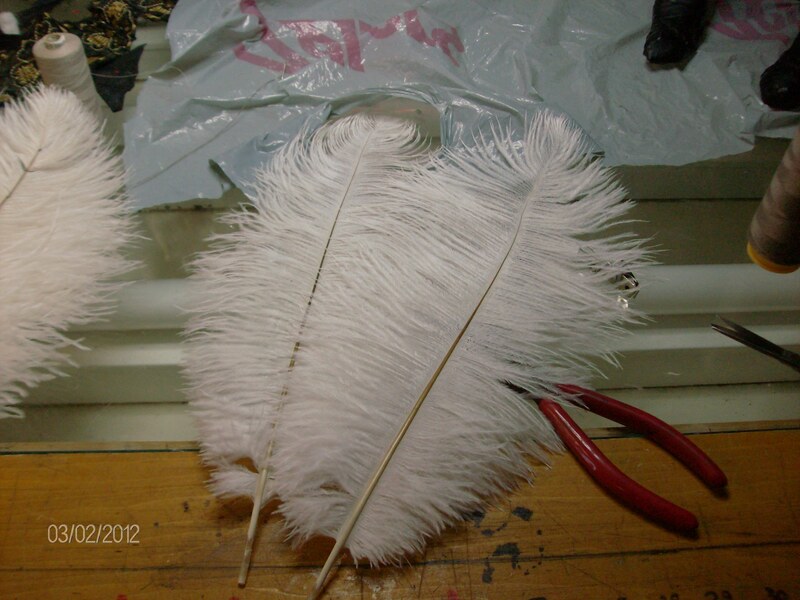 So I moved on to preparing the feathers. After searching the Internet for a while I liked this lady’s tutorial the best. It was well photographed and clearly explained: http://lynnmcmasters.com/OstrichPlumes.html. 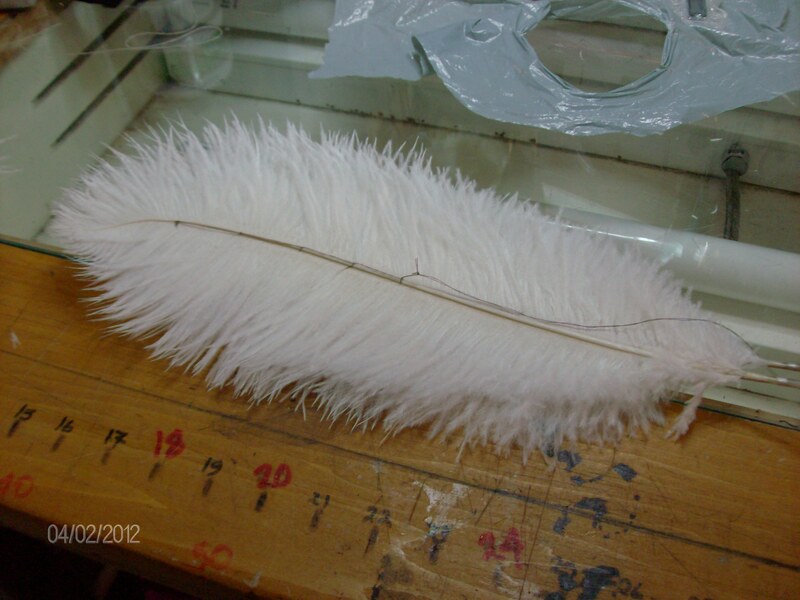 It took me a day to prepare the 20 feathers I had. 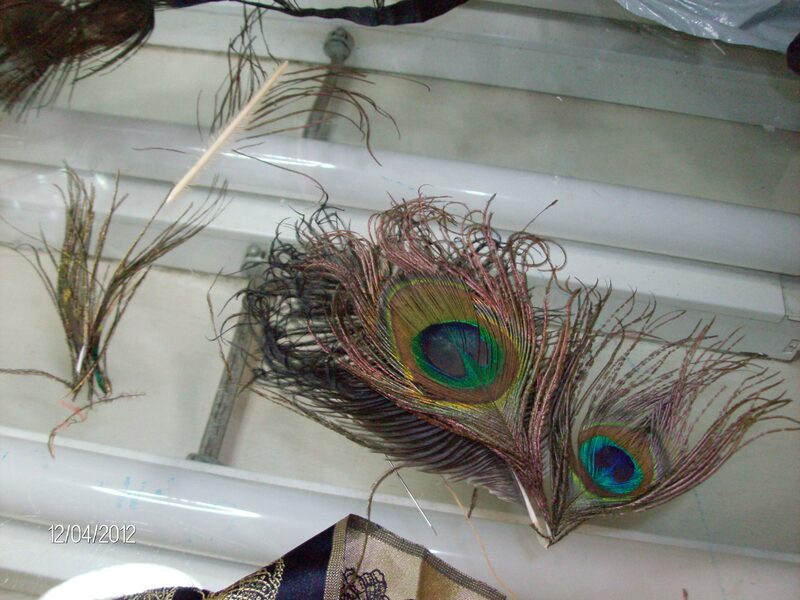 They were prepared in sets of 2 and 3 feathers. Then they were steamed for pushing the shafts all in one direction. 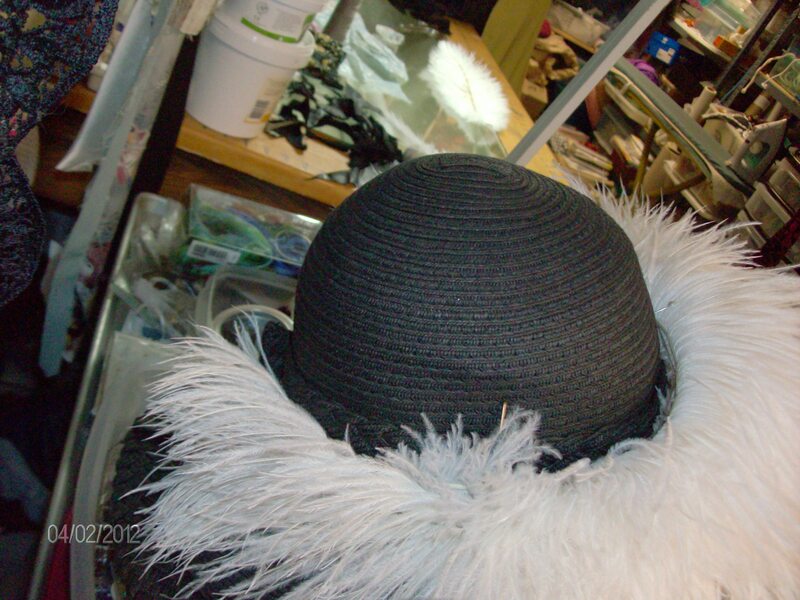 After they cooled down and I was confident they were dry enough, they were curved into wide arcs to fit around the crown of my hat. 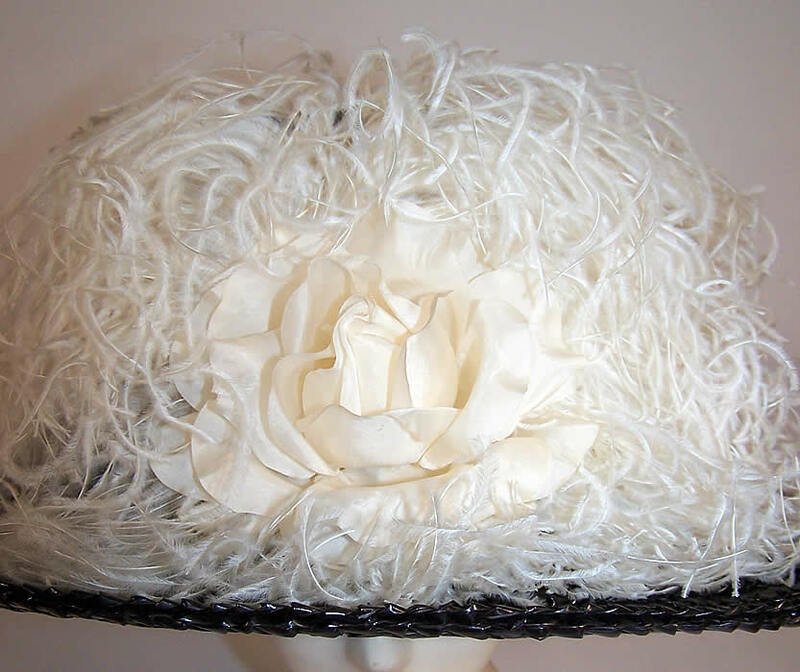 Today I am wondering whether I should lacquer it to make it shinier as it is in the picture that completely enchanted and inspired me to make this hat or should I leave it looking *natural*? 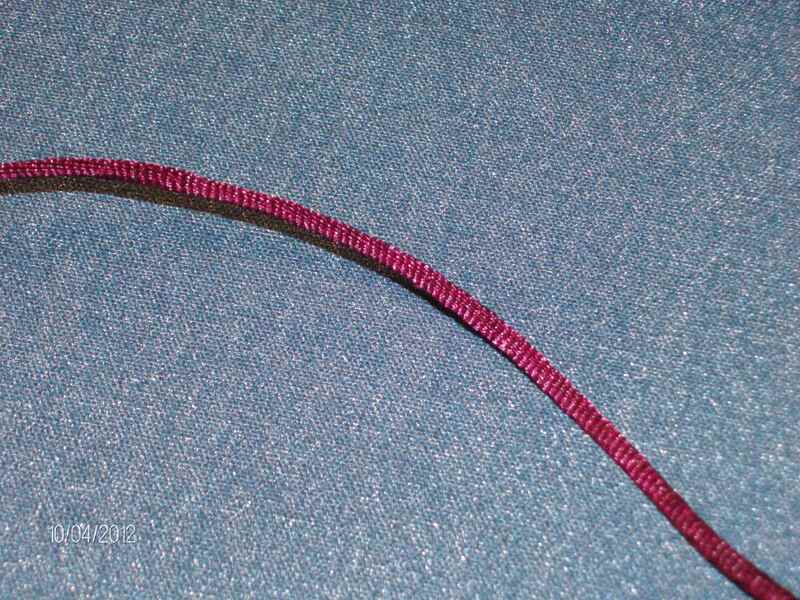 I am also deciding whether to sew the feathers on a band attached by *Velcro* which will make them removable, so I can sometimes wear the hat with the twisted chiffon band I made for it in my favourite colour: magenta. 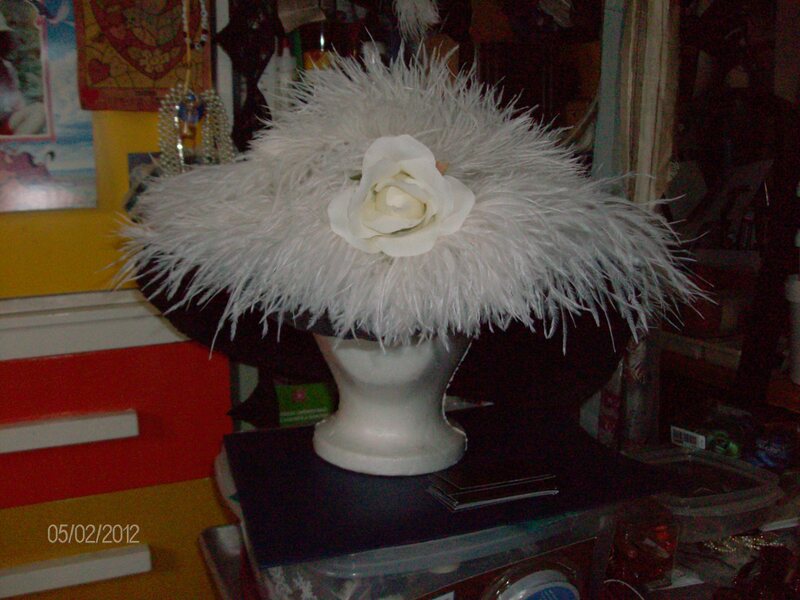 That way the hat can be worn on more casual occasions.